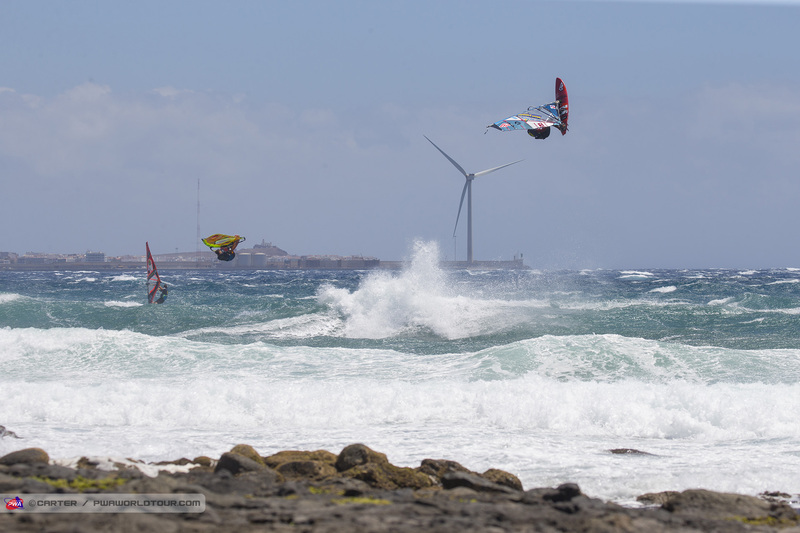 This year's Gran Canaria Wind & Waves Festival marks the 30th anniversary of PWA World Cups in Pozo Izquierdo and by the look of the forecast it’s going to be one you are not going to forget about for a long time with trademark howling winds and waves predicted for the duration of the event, which kicks off tomorrow and runs until the 21st July. 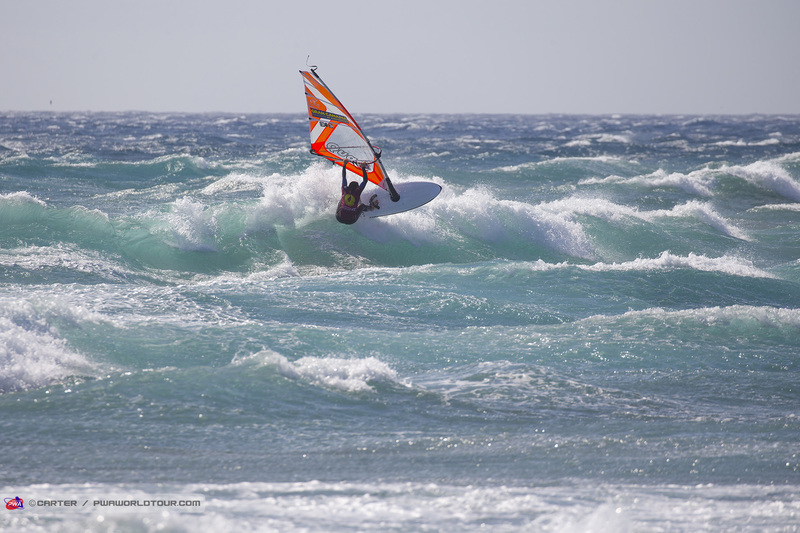 Pozo Izquierdo is internationally famed in the windsurfing world due to its unrelenting wind and steep waves. The combination of these two factors creates the perfect playground for the world’s most extreme sailors to defy gravity and perform the biggest stunts on the planet. 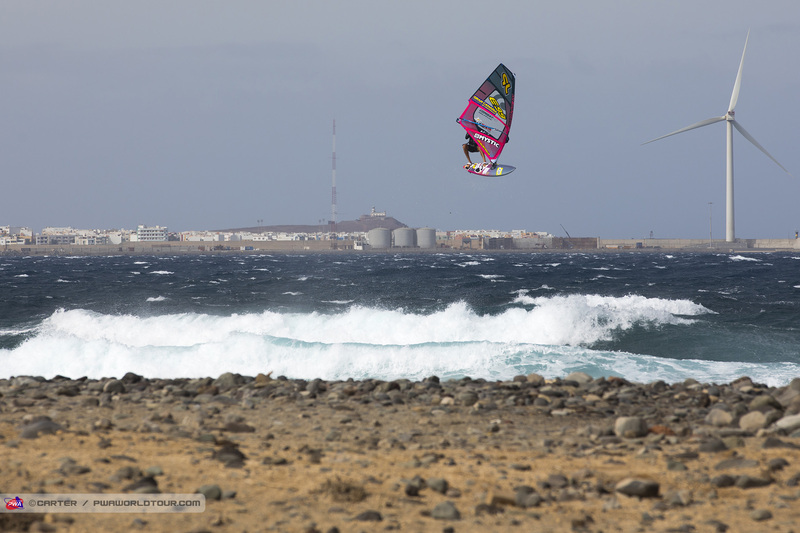 The local effects mean that even the slightest breeze can soon be accelerated to nuclear strength, with the wind peaking at around 50-60 knots and based on the current forecast that should see the guys and girls reaching for their smallest equipment. Iballa Moreno (Starboard / Severne / Maui Ultra Fins) may hold the early season title race lead after claiming a stylish victory during the Morocco PWA World Cup in April, but it will be her sister Daida Moreno (Starboard / Severne / Maui Ultra Fins), who starts as the favourite for the second event of the year with 16 victories and a 2nd place in the last 17 years - a quite remarkable record. 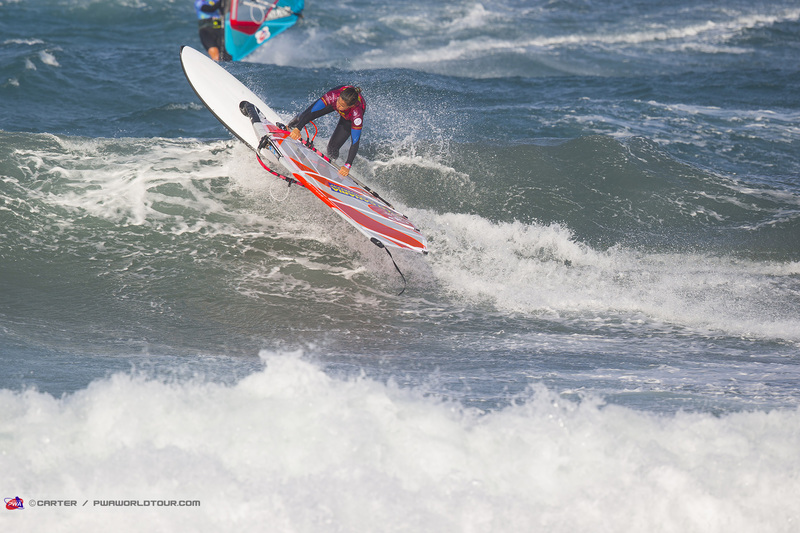 However, it is Iballa who has come out on top overall in recent years, having won the world title for the last 4 years and she currently leads this year’s tour, so Daida will know it is imperative to win here if she wants to reclaim the women’s wave world title for the first time since 2013. It is likely the Moreno twins’ biggest threat will come from either Sarah-Quita Offringa (Starboard / NeilPryde / Maui Ultra Fins), who currently occupies second place in the overall rankings, or Lena Erpenstein (Severne / Severne Sails), who earned her first podium here in 2017 but the German has been studying, and training when possible, so it will be interesting to see if the 21-year-old can bring that same level with less practise. Meanwhile, Offringa has the experience of beating the Moreno twins, but it would a huge ask to beat them both on home waters. 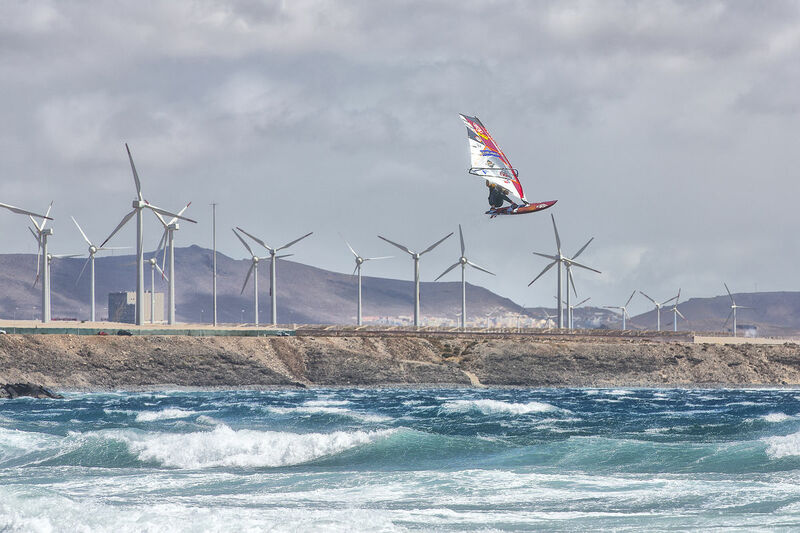 However, the 14-time world champion has been spending more time in Pozo Izquierdo in order to try and become more comfortable in the extreme conditions and can never be ruled out. 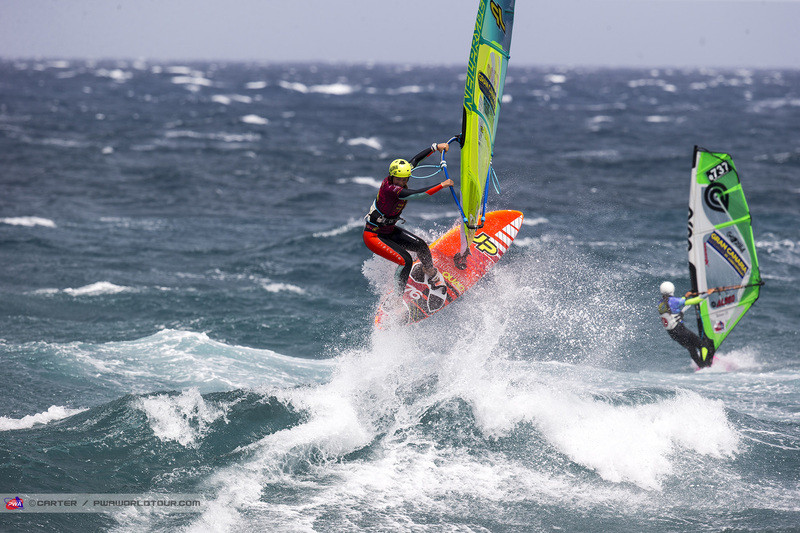 Justyna Sniady (Simmer / Simmer Sails / AL360) is reportedly feeling better than ever sailing in Pozo and the Pole comes into her first event of the season on the back of her best season yet in 2017 - where she earned 5th overall and will no doubt be gunning to go one or two places better this time around. 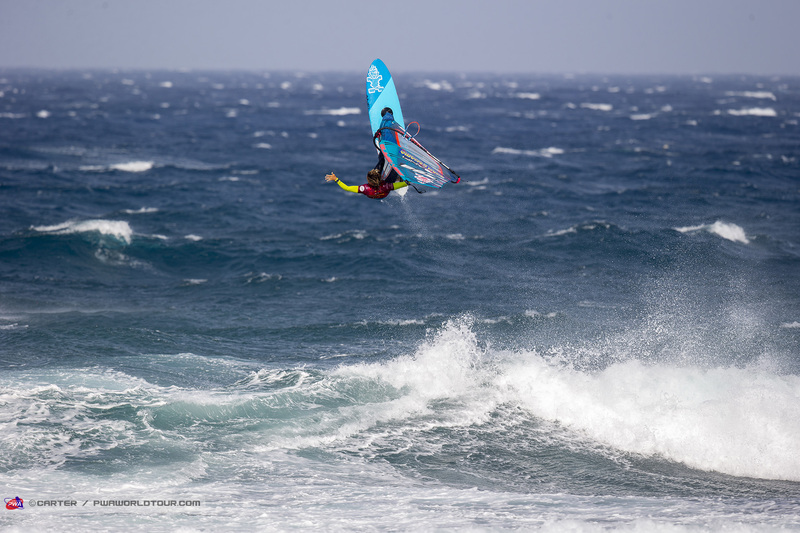 Last year we only saw Steffi Wahl (Sailloft Hamburg) at one event - Sylt where she finished 6th - but the German lines up in Pozo and with all of her experience and stylish approach she will be a definite threat. Elsewhere, Marine Hunter (KA Sail) will look to build upon an excellent 5th place in Morocco, but will face a completely different set of conditions over the next 7 days, while former overall top 3 Nayra Alonso (Fanatic / Severne Sails) will try to make her impression felt again as will youth world champion - Nicole Bandini (Fanatic / Duotone) and fellow Italian’s Greta Benvenuti (I-99 / Challenger Sails / AL360), Caterina Stenta (RRD / RRD Sails / Maui Ultra Fins) and Serena Zoia (I-99 / Loftsails). 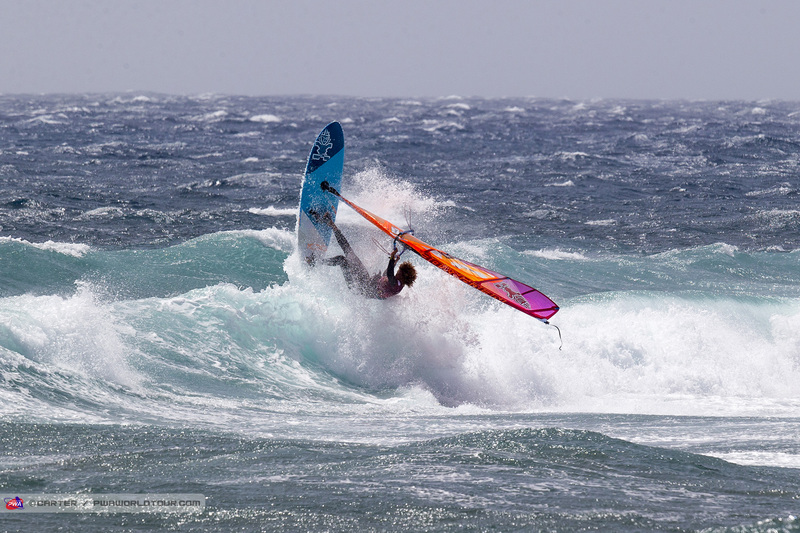 Meanwhile, several women more known more for their freestyle exerts - Arrianne Aukes (Fanatic / Duotone / Maui Ultra Fins), Oda Johanne (Starboard / Severne / Maui Ultra Fins) and Maaike Huvermann (Starboard / Severne / Maui Ultra Fins) will also be trying to make further inroads on the wave scene. 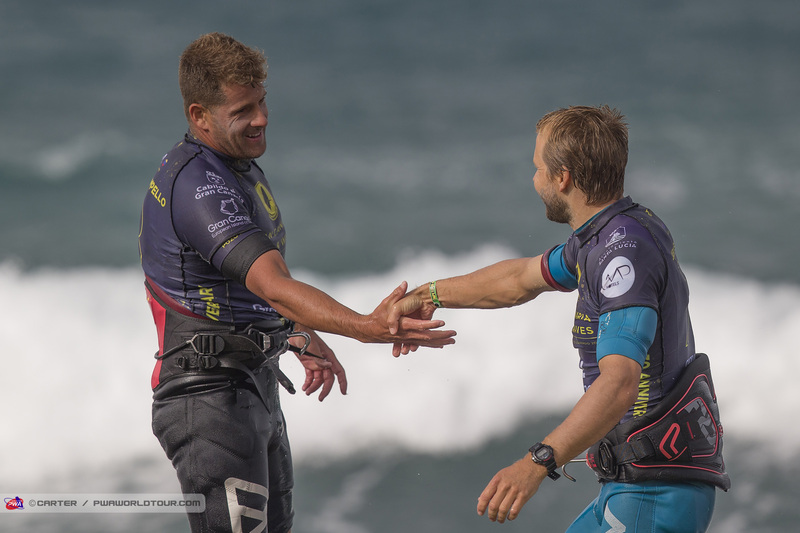 Statistically speaking it is almost impossible to look past either current world champion - Philip Köster (Starboard / Severne / Maui Ultra Fins) or former 2-time world champion - Victor Fernandez (Fanatic / Duotone / Shamal Sunglasses) - when it comes to looking at the eventual winner of the 2018 GCWWF. Between them they have shared the event titles since 2006 - with Fernandez winning 6 events (2006, 07, 08, 10, 14, 16) and Köster winning 5 (2009, 11, 12, 15, 17) (no result in 2013) - while Fernandez boasts an incredible record of not finishing outside the top 2 since then. while the other major threat you would have to feel is Ricardo Campello (Point-7), who seemingly has pushloop forwards on tap. Campello’s talent has never been in doubt, however, whether he is able to produce pure brilliance heat-after-heat - and under pressure - remains to be seen. If everything clicks into place though, Campello will be one of the top guns. As you may have seen in Ben Proffitt’s (Simmer / Simmer Sails) training diaries the level seems to have gone through the roof again and therefore there are numerous other candidates - especially since the men’s fleet has been extended again to the top 48. 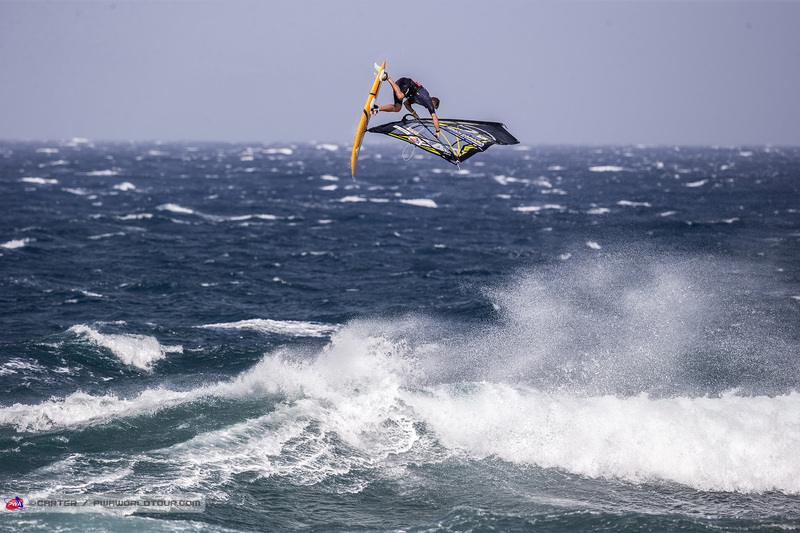 Antoine Martin (NeilPryde) remains one of the most radical sailors in the world, but like Campello, consistency will be key if he wants to make inroads into the top 5 and beyond. Both have been pushing ridiculously hard coming into the opening men’s wave event with both throwing themselves into double and even triple rotations. Meanwhile, you can never rule out Alex Mussolini (RRD / RRD Sails) or Thomas Traversa (Tabou / GA Sails), who have been at the top of the game for so many years, however, you would have to feel that on the current forecast the winner will come from being able to land a double and a pushloop forward in the jumping category - followed up by both rail turns and aerial manoeuvres - the latter of which is no problem for either. Having said that, the forecast looks so crazy that anything could happen and these two seem to excel the more extreme the conditions become. Adam Lewis (Fanatic / Duotone / SWOX) enjoyed his best year to date on the world tour in 2017 and will look to build upon that over the next 7 days…. Can the Brit better a 7th place start he made here last year? Jaeger Stone (Starboard / Severne / SWOX / Shamal Sunglasses) certainly didn’t perform badly last season, but after being on the wrong side of a few close calls the Australian finished outside the overall top 5 for the first time since 2015 - 7th - and will now look to bounce back. 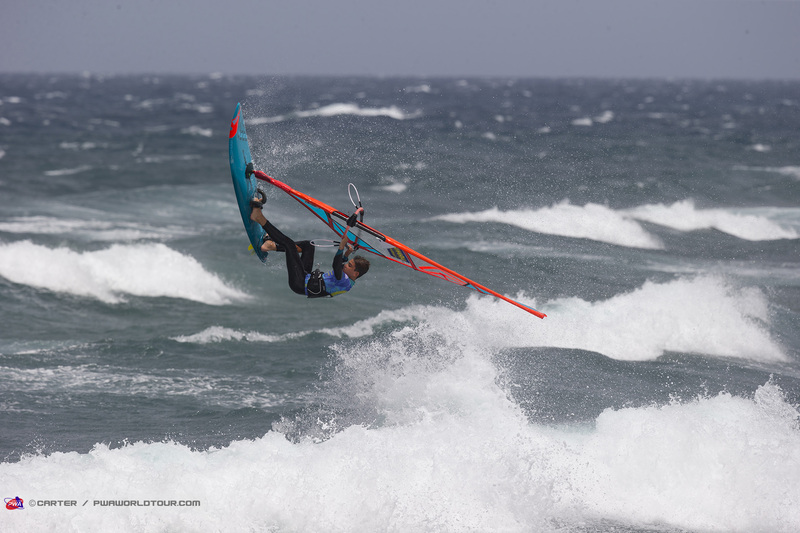 The depth of talent on the men’s wave world tour is quite incredible at the moment so an easy run through to the latter stages no longer exists and you can expect to see - Dany Bruch (Flight Sails / AL360 / Shamal Sunglasses), Marc Paré (Simmer / Simmer Sails), Omar Sanchez (Carbon Art / KA Sail), Robby Swift (JP / NeilPryde / SWOX), Jules Denel (JP / NeilPryde), Leon Jamaer (JP / NeilPryde) all pushing hard for the top 10, while Pozo experts Josep Pons (Simmer / Simmer Sails) and Dario Ojdeda (Flikka / Flight Sails) should also be right in the thick of the action. 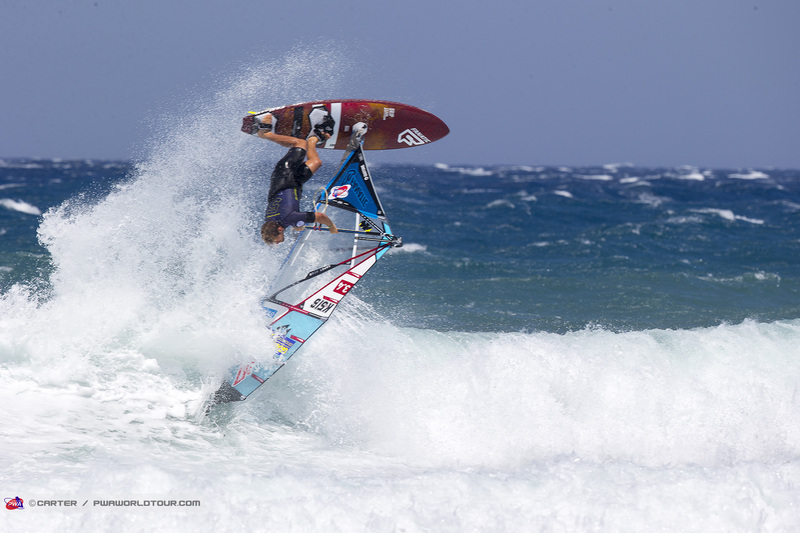 Don’t be surprised either to see the youthful talents of Marino Gil (Goya Windsurfing), Lock Lesauvage (Goya Windsurfing / Shamal Sunglasses) or Noah Vocker (Fanatic / Duotone / Maui Ultra Fins) all enter the fray also. Over the years future world class wave sailors have come from a freestyle background - namely 3-time wave world champion Kauli Seadi (I-99 / Hot Sails Maui), 3-time freestyle world champion Ricardo Campello, Marcilio Browne and Dieter van der Eyken (Severne /Severne Sails), who both won one freestyle world title each, while the Brazilian already has one wave world title to his name, as does Thomas Traversa - but there are now more freestylers waiting to take aim in the waves and cause a few upsets. Firstly, 8-time freestyle world champion - Gollito Estredo (Fanatic / Duotone) - who already looked incredibly dangerous in Sylt and has been spending a fair amount of time training in Pozo ahead of the first event of the season, plus vice-world champion Amado Vrieswijk (JP / Severne), who is competing in his first wave event, Antoine Albert (Goya Windsurfing) followed by the Italian duo of Franceso Cappuzzo (RRD / RRD Sails / AL360) and Jacopo Testa (RRD / RRD Sails / AL360). 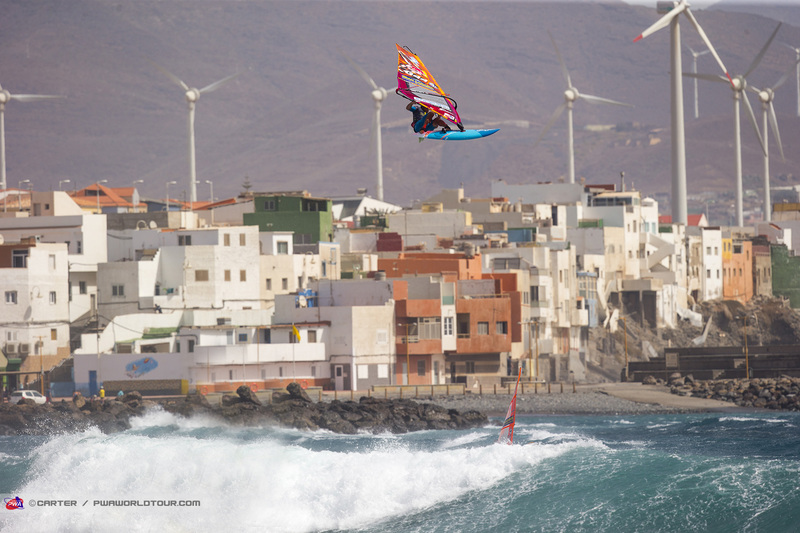 With an unbelievably good looking forecast the 2018 Gran Canaria Wind & Waves Festival looks set to start with a bang… Don’t miss any of the incredible action by tuning into www.pwaworldtour.combetween 15th-21st July. 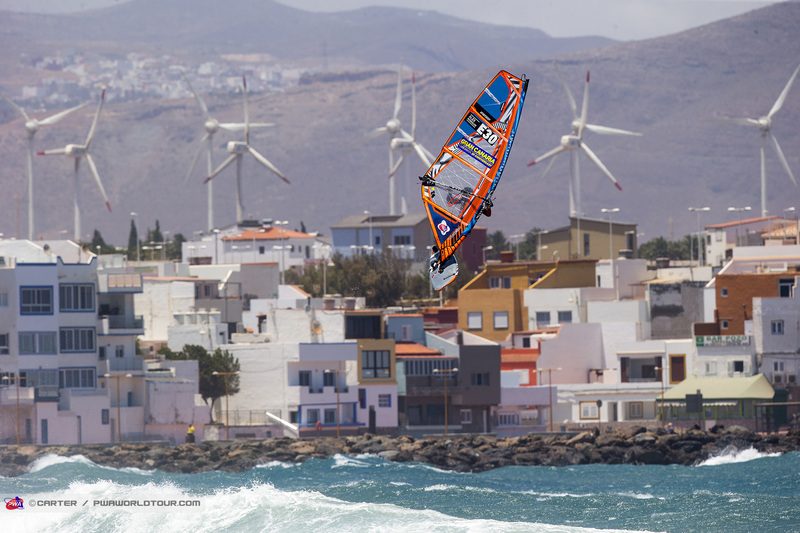 You can stay up to date with all the latest developments from Gran Canaria— including the live stream, elimination ladders, entry list, images and live ticker simply by clicking HERE and scrolling to the bottom of the page. 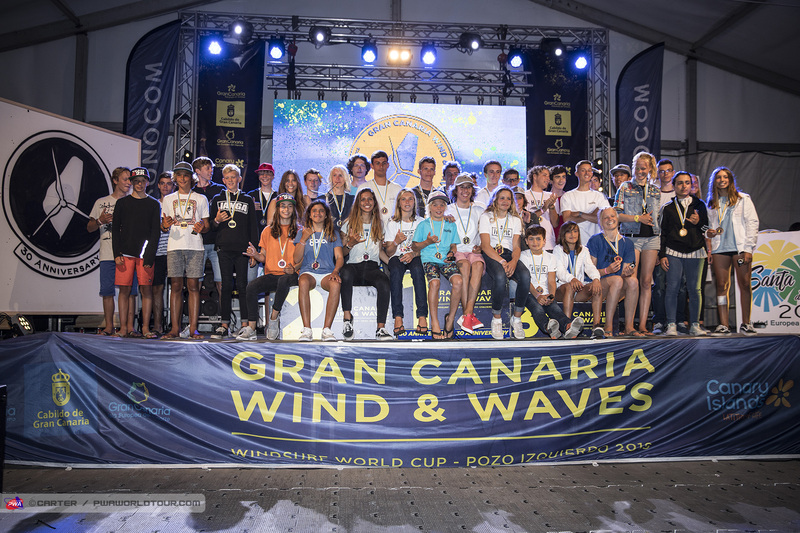 The opening day of the 2018 Gran Canaria Wind & Waves Festival saw a full fleet of men - 48 - register for the next 7 days of competition, while 24 women also signed up as well as a record number of Youths with 35 boys and 11 girls. After registration, the competition began at 1:30pm in 35-45 knots of wind, which sent the sailors running for their smallest equipment. 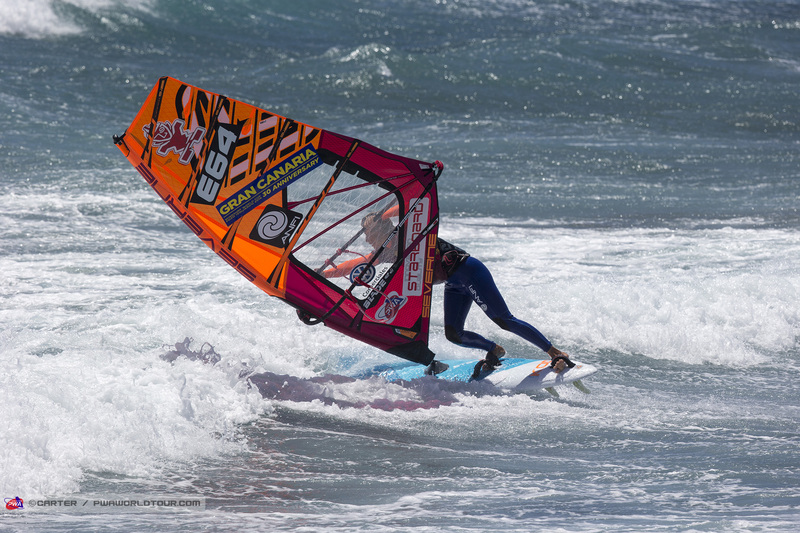 In the opening women’s heat Caterina Stenta (RRD / RRD Sails / Maui Ultra Fins) faced 14-year-old Mar de Race (Loftsails), but the Italian avoided any upsets with a competent display, while Maaike Huvermann (Starboard / Severne / Maui Ultra Fins) overcame Birgit Rieger (Flikka) with an excellent jumping performance, which saw the 20-year-old land a textbook forward before also stomping a backloop. 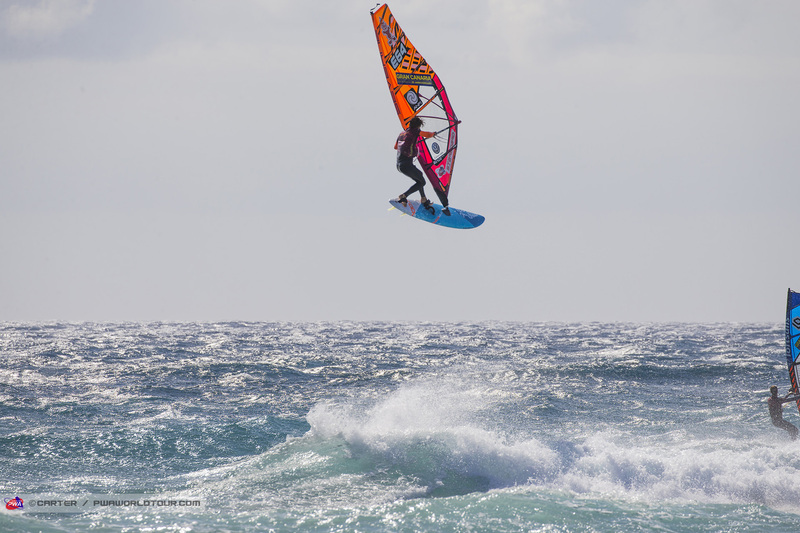 Huvermann’s jumping was excellent, but she will need to perform better in the waves particularly as she goes up against Sarah-Quita Offringa (Starboard / NeilPryde / Maui Ultra Fins) in round two. Youth world champion - Nicole Bandini (Fanatic / Duotone) - scraped through her opening heat against 15-year-old Line Bang Wittrup (Patrik / Sailloft Hamburg) and the Italian will now look to improve when she goes up against Marine Hunter (KA Sails) in the next round. Meanwhile, like Huvemann, Oda Johanne’s (Starboard / Severne / Maui Ultra Fins) jumping saw her cause a bit of an upset against Sarah Hilder (Simmer / Simmer Sails) as the freestyle girls enjoyed some success on the opening day. In the following heat Nayra Alonso (Fanatic / Severne) was the clear standout as she quickly produced the highest scoring heat up to that point with a forward loop and a tabletop, but it was her wave riding that really caught the eye as she linked together two frontside turns and a backside air to earn 7 points in Heat 6a, while in Heat 5a Lena Erdil (Starboard / Point-7 / AL360 / Chopper Fins) progresses at the expense of Svetlana Kolpikova Bala. The final heat of the day was worth waiting for as Steffi Wahl (Sailloft Hamburg) earned the highest score of the day - 27.88 points - after producing her usual stylish wave riding, while also landing a backloop and a forward to end the hopes of Alexa Escherich (JP / NeilPryde). The conditions were extremely challenging today as winds from around 35-45 knots saw most sailors reaching for either their 3.0s or 3.4s, while hunting out the waves required some patience and then excellent timing and reading to make the most out of the scoring opportunities. 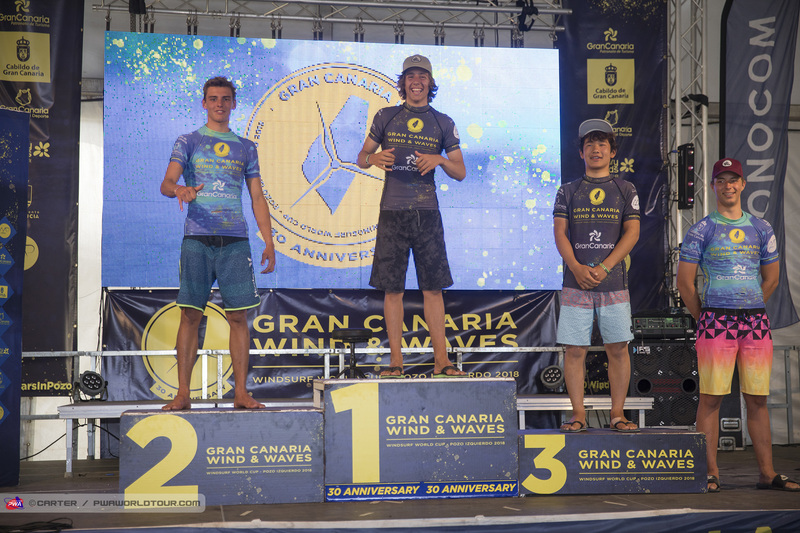 While they may be two of the youngest sailors competing 15-year-old - Marino Gil (Goya Windsurfing) and 18-year-old Loick Lesauvage (Goya Windsurfing / Shamal Sunglasses) - produced the highest scoring heats of the first round, 24 points and 24.75 points, respectively to steal the show with impressive wave riding and jumping in the extreme conditions. Gil ended the hopes of Alex Grand-Guillot (Fanatic / Duotone) in Heat 2b, while Lesauvage defeated Arthur Arutkin (Fanatic / Duotone) in Heat 8b. 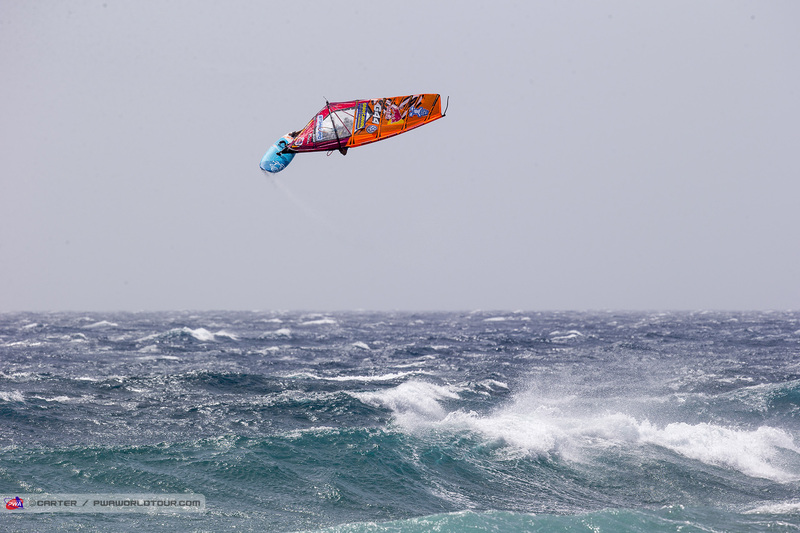 Arutkin was unlucky at the start of the heat after seeing his board and sail separate mid-air after bailing on a double forward attempt, which cost him valuable time and couldn’t quite recover and will now have to wait for the double elimination. In the opening heat of the day 19-year-old - Julian Salmonn (Gun Sails) - dispatched of Ben Proffitt (Simmer / Simmer Sails) with a solid display on the a-side, while Antoine Albert (Goya Windsurfing) just edged out Jose Romero Santana (Mistral / Challenger Sails) by just half a point to progress. Antoine Martin (NeilPryde) made a safe start to his campaign in Heat 2a with a relatively comfortable victory over Spain’s Miguel Chapuis (JP / NeilPryde). 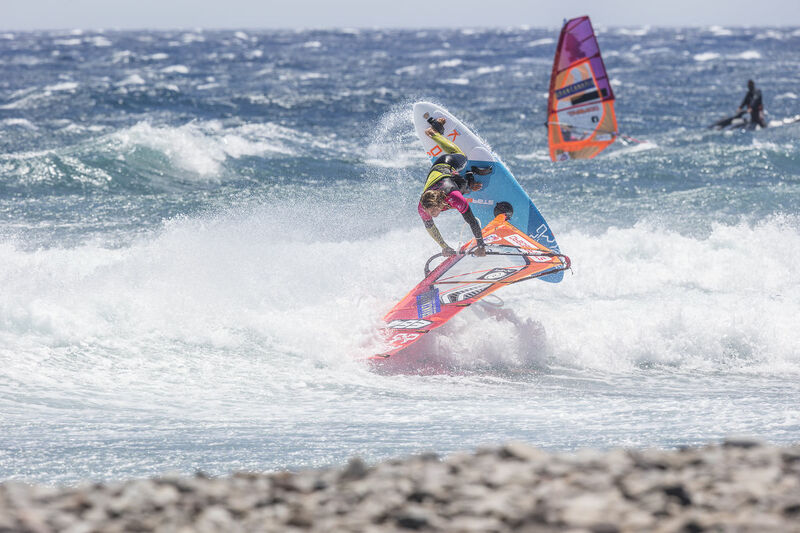 Heat 3 saw Dario Ojeda (Flikka / Flight Sails) go up against Francesco Cappuzzo (RRD / RRD Sails / AL360), while fellow local boy Pablo Ramirez (Patrik / Sailloft Hamburg) faced Jacopo Testa (RRD / RRD Sails / AL360) in the battle of the locals versus the Italian freestylers, but there were varying levels of success for the locals with only Ojeda progressing as Testa took down Ramirez - with his second wave, in particular, inflicting most of the damage as the Italian landed a radical goiter to earn 6.5 points. Fellow local Josep Pons (Simmer / Simmer Sails) survived a minor scare against 17-year-old Takara Ishii (RRD / RRD Sails), who led for a large part of Heat 4a, but Pons eventually overturned the deficit as he stomped a double forward and a backloop to progress, while on the b-side Morgan Noireaux (JP / Hot Sails Maui) produced the highest scoring wave total of the day - 14 points - to dispatch of Sweden’s Markus Rydberg (Simmer / Simmer Sails). Heat 5a saw the lead consistently change hands between Kenneth Danielsen (Flikka / Simmer Sails) and Mads Bjørnå (Fanatic / Duotone), but in the end, it was Bjørnå who prevailed from the battle of the Danes after landing a late backloop and connecting together his best wave with his penultimate effort. 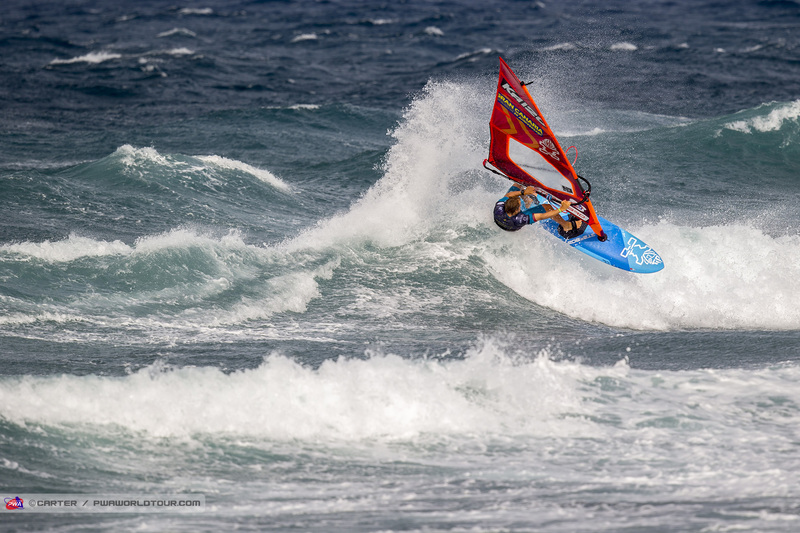 Meanwhile, Jose ‘Gollito’ Estredo (Fanatic / Duotone) overcame teammate Noah Vocker (Fanatic / Duotone / Maui Ultra Fins) to set up a tie against Thomas Traversa (Tabou / GA Sails) in the second round. Heat 6a saw a tight start between Dieter van der Eyken (Severne / Severne Sails) and Amado Vrieswijk (JP / Severne), who was making his first appearance in the waves, but in the end the Belgian’s additional experience paid off as he landed an excellent frontside 3 to clearly progress on waves, while Vrieswijk edged the jumping. 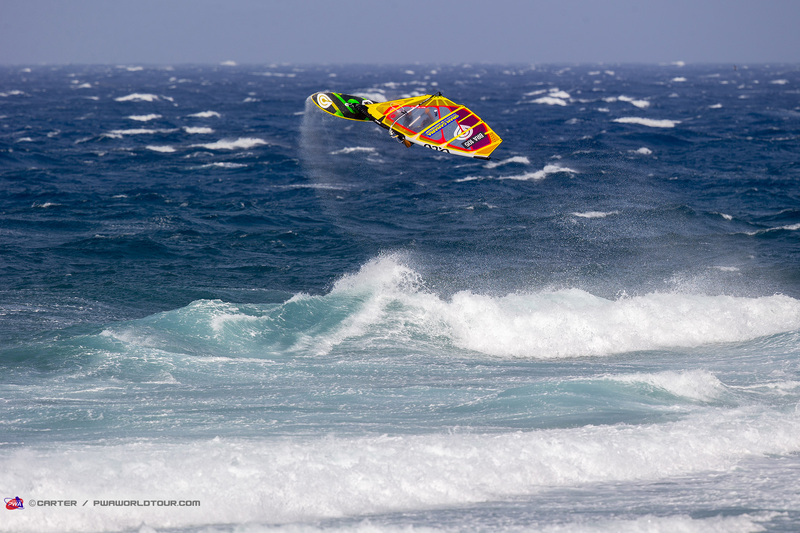 On the other half of the draw, Eric Sanllehy (Goya Windsurfing) saw off the challenge of Jake Schettewi (JP / Hot Sails Maui). In the penultimate heat of the first round Graham Ezzy (Tabou / GA Sails) proved too much for Gustav Haggstrom (Simmer / Simmer Sails), while Florian Jung (Starboard / Gun Sails) survived a bit of a scare against Guillermo Alba Lasheras (Goya Windsurfing) to advance, however the German will need to up his game if he wants to go any further as he faces Jaeger Stone (Starboard / Severne / SWOX / Shamal Sunglasses) in the next round. In the other half of Heat 8 Jules Denel (JP / NeilPryde) sailed confidently throughout to process against Takuma Sugi (Tabou / GA Sails). 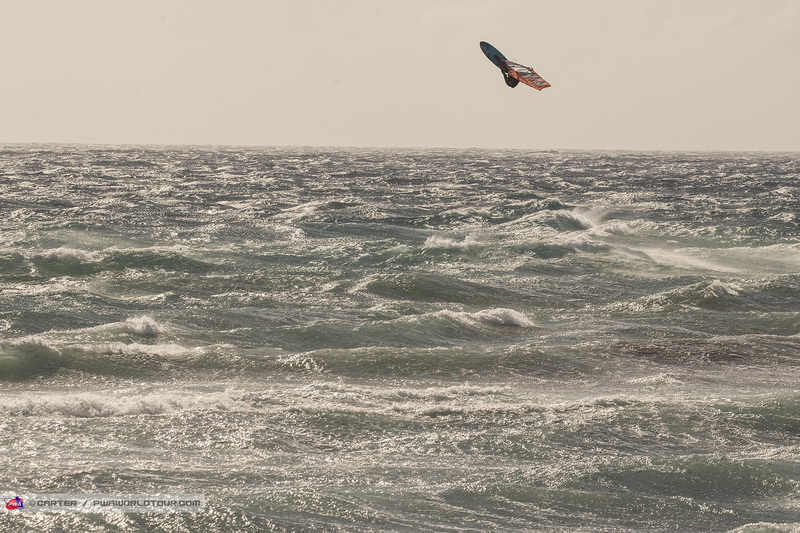 Tomorrow looks set to be even windier than today based on the forecast and the swell is expected to increase, which should hopefully lead to a day of insane action from the world’s most radical sailors. The skippers’ meeting has been called for 10am with the action commencing from 10:30am (GMT+1) onwards. 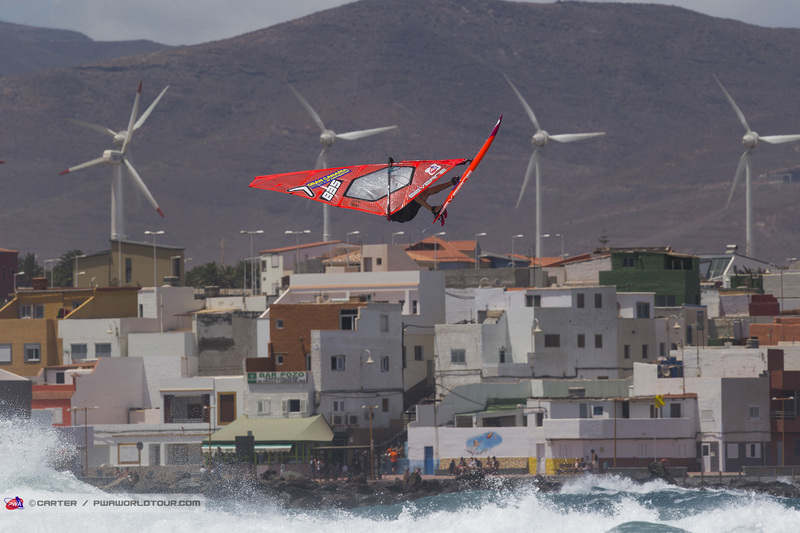 Don’t miss any of the action by tuning into www.pwaworldtour.com. Die Single Elimination ging Gestern schon mal an Philip, damit ist ihm der 2. Platz vor der Double Elimination bereits sicher. 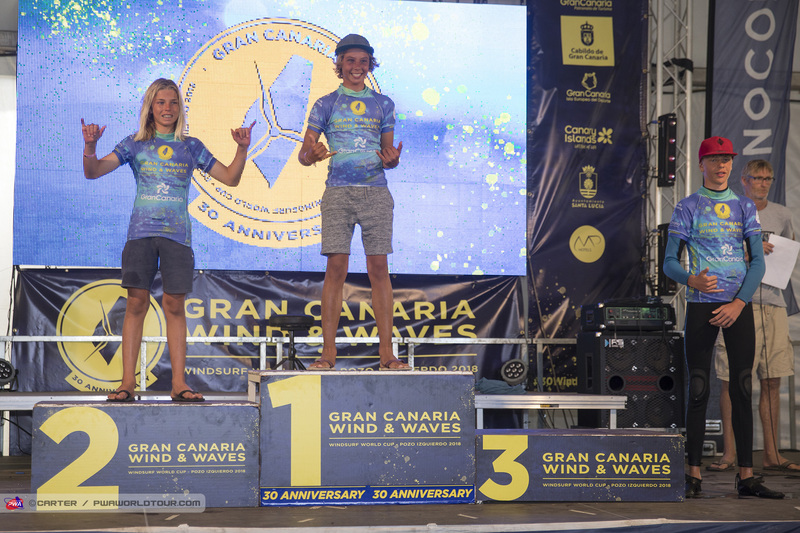 Yesterday may have been windy, but Day 2 of the 2018 Gran Canaria Wind & Waves Festival was even windier as winds in excess of 50 knots saw the men take centre stage while reaching for their 3.0s and 3.4s at times - particularly during the morning. 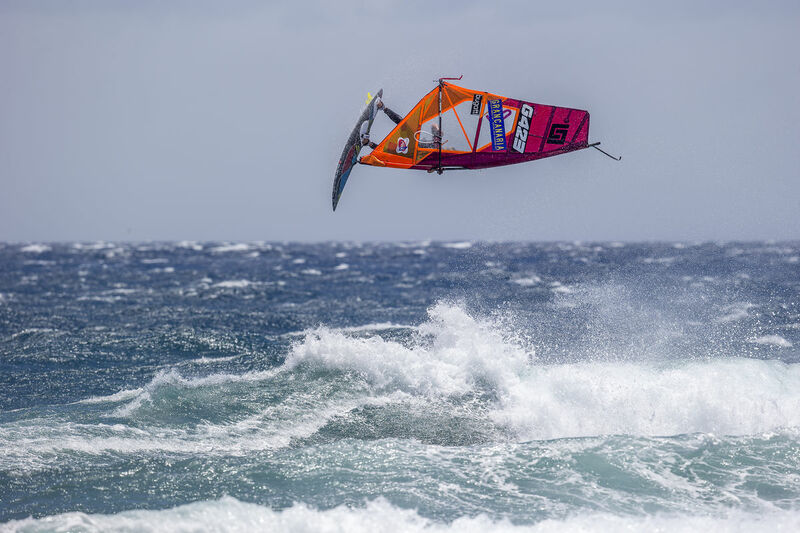 The level seen today was certainly one of the highest ever seen as the best wave sailors in the world continued to raise the bar on competition windsurfing right from the very first heat. In the end, despite a few scares and close heats, there was a familiar set of faces at the top of the rankings come the end of the single elimination - with reigning world champion - Philip Köster (Starboard / NeilPryde / Maui Ultra Fins) - taking home top honours, for now at least. 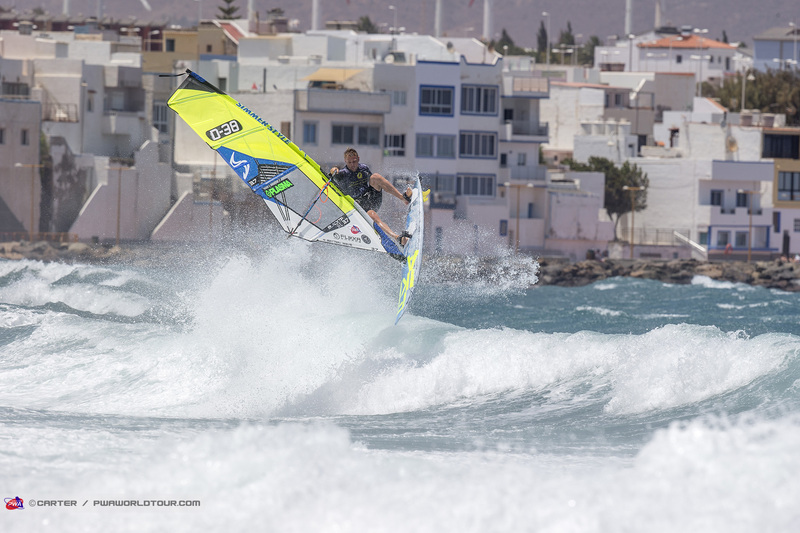 Philip Köster was in irresistible form all day as the 4-time world champion made a confident start to his title defence by winning the single elimination ahead of Marcilio Browne (Goya Windsurfing). Köster landed at least one pushloop forward in every heat apart from his first heat of the day, while landing a trademark double in every heat. 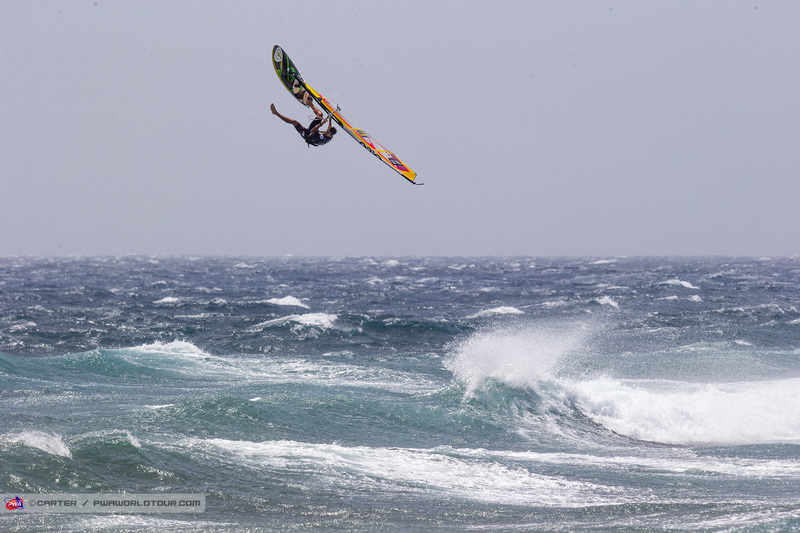 The 24-year-old was also in fantastic form on the wave as he combined powerful gauges with front and backside 3s to end the hopes of Loick Lesauvage (Goya Windsurfing), Jules Denel (JP / NeilPryde), Jaeger Stone (Starboard / Severne / SWOX / Shamal Sunglasses), Alex Mussolini (RRD / RRD Sails) and finally Marcilio Browne. Marcilio Browne survived a scare against Antoine Martin (NeilPryde) in Heat 17b as the Brazilian produced a buzzer beater to overturn the result after racking up a 7.5 point last wave when firmly under the cosh. 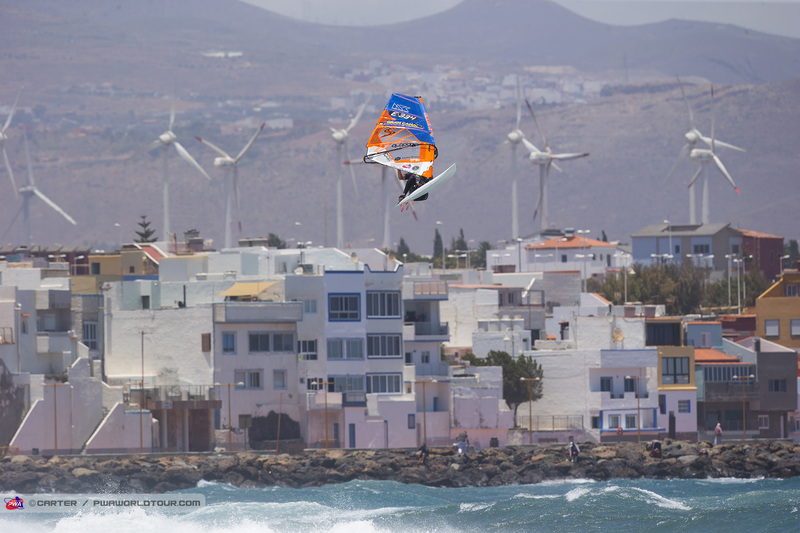 Having kept his hopes alive, Browne then stopped Adam Lewis (Fanatic / Duotone / SWOX) in his tracks to set up a tie against Victor Fernandez (Fanatic / Duotone / Shamal Sunglasses), which the 29-year-old would go on to win to book his place in a Winners’ Final in Pozo for the first time - while guaranteeing himself a podium finish in Gran Canaria for the first time since 2014. Browne, wasn’t done there though and he pushed Köster all the way in a close fought final, but in the dying minutes, he couldn’t find a wave that offered the scoring opportunity that he required - 7.01 points or better. Against Browne, Fernandez almost produced a miraculous last minute comeback having suffered equipment failure earlier in the heat, which put the pressure on Fernandez. Heading into the last couple of minutes it looked as though Browne was home and dry, especially after the 2-time world champion crashed his opening double forward attempt with 2 minutes to go… however, Fernandez wasn’t done yet as he launched into a tabletop forward before racing down to the bunker and executing a perfect double, which was greeted by massive cheers on the beach. However, despite a sterling effort Fernandez fell short by just 1.12 points. This was the first time since 2015 that Fernandez has missed out on the Winners Final in the single elimination in Gran Canaria, but the Spaniard edged a tight duel against Alex Mussolini to secure 3rd place and he’ll now be determined to fight back through the double to keep his incredible top 2 record (6x 1st and 5x 2nd in the last 11 years) alive. Mussolini may have just missed out on the podium in the single elimination, but will still be very happy with his day's work. 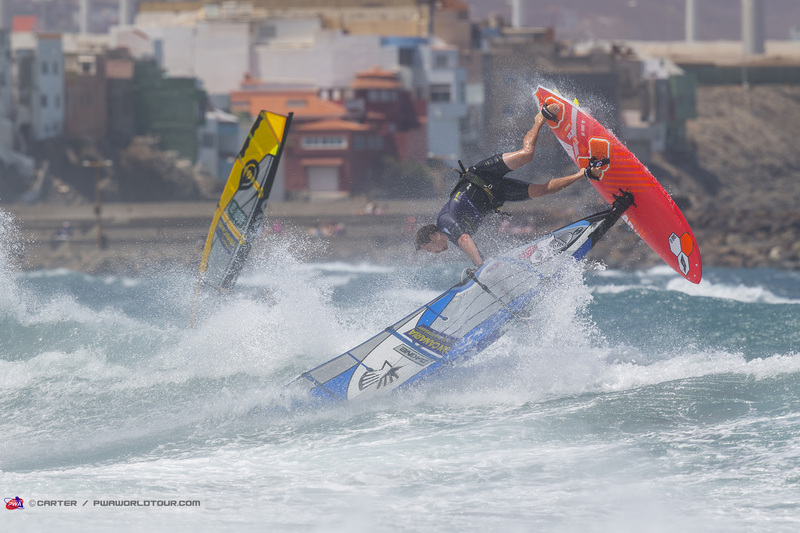 The Spaniard outscored Köster in the waves department in their semifinal, but couldn’t match his jumping prowess, but if in the double elimination there are only two jumps to count then the Spaniard could certainly fight back to claim his first podium in Gran Canaria since 2015. Birthday boy - Ricardo Campello (Point-7) - may have posted the highest scoring heat of the day (with 2 waves and 2 jumps to count), as he earned an impressive 35.08 points out of 40, against Robby Swift (JP / NeilPryde / SWOX) in Heat 18a to emerge as one of the front-runners for the single elimination title, but the 33-year-old wasn’t able to sustain that level as he fell in the very next heat to his nemesis Victor Fernandez. Campello started in the same positive light against Fernandez, as he did against Swift, landing a perfect pushloop forward, but he then failed to build from there as he crashed 4 double forward attempts, which eventually wrote the story of his day as he had to settle for 5th place in the single. You certainly can’t rule Campello out in the double elimination as he is clearly capable of going toe-to-toe with the likes of Köster, Fernandez and more recently Browne, but the thing that separates the worlds current top 3 does seem to be that extra killer instinct and consistency when it really matters. Move of the Day or Move of the Decade? Jaeger Stone landed the move of the day in Heat 22b as the Australian landed an absolutely incredible pushloop forward bolt upright to earn 11 points… in a jump that some are calling the best they have ever seen. 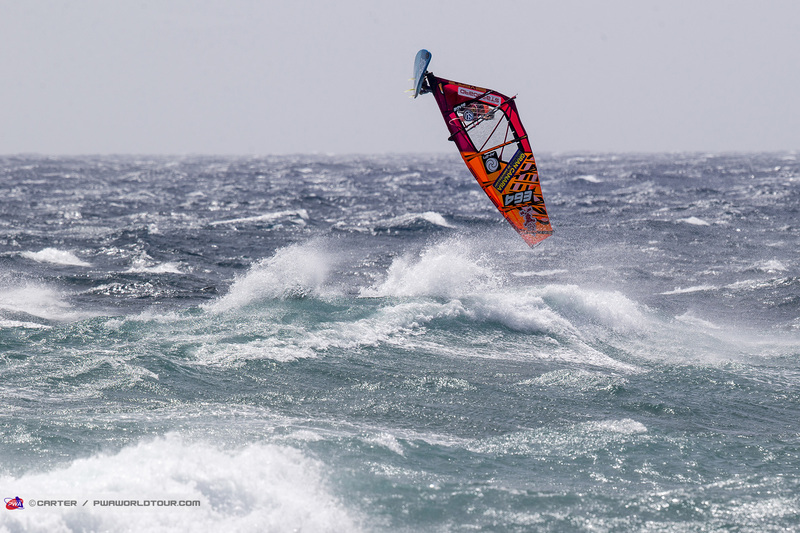 Unfortunately, for Stone, he was up against Philip Köster, who on his opening run landed a trademark double forward, an almost perfect pushloop forward and a one-handed backloop all in about 45 seconds. Adam Lewis showed that he’s ready to battle for the top positions again in 2018 after his best year yet in 2017 but just fell short against Browne when trying to break into the top 4. The Brit earned the highest scoring wave of the day - 8.88 points against Browne, but even that wasn’t enough to stop the Brazilian and he finishes the single in joint 5th. The same is also true for the aforementioned - Jaeger Stone - who as well as producing the jump of the day, also looked one of the most dangerous on the wave with frontside airs, trademarks turns and goiters all being landed. The Australian snuck through against Dany Bruch (Bruch Boards / Flight Sails / AL360) with his last wave of the heat proving to be the difference. Meanwhile Gollito Estredo (Fanatic / Duotone) claims the remaining place in joint 5th after causing one of the upsets of the day by defeating Thomas Traversa (Tabou / GA Sails) - who finished 3rd here last year - before navigating his way past Aleix Sanllehy (Tabou / GA Sails), at wish point Mussolini brought his charge to an end. The top 10 is currently completed by 8 sailors who share joint 9th - Marc Paré (Simmer / Simmer Sails), Dany Bruch, Dieter van der Eyken, Robby Swift, Antoine Martin, who landed a 10 point push forward and threw himself into a double pushloop attempt, Jules Denel, Aleix Sanllehy and Josep Pons (Simmer / Simmer Sails). 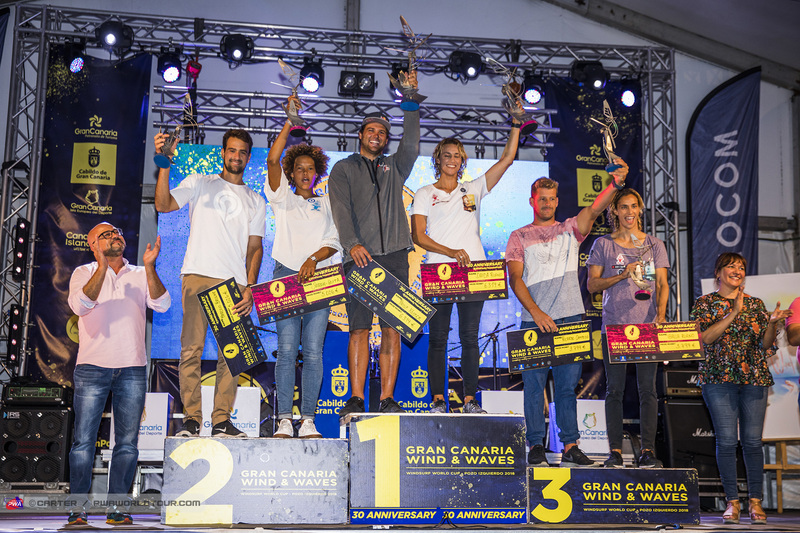 The action looks set to continue on Day 3 of the 2018 Gran Canaria Wind & Waves Festival with another excellent forecast to come. The sailors will meet again at 10 o’clock tomorrow morning for the skippers’ meeting with the action commencing from 10:30am (GMT+1) onwards. 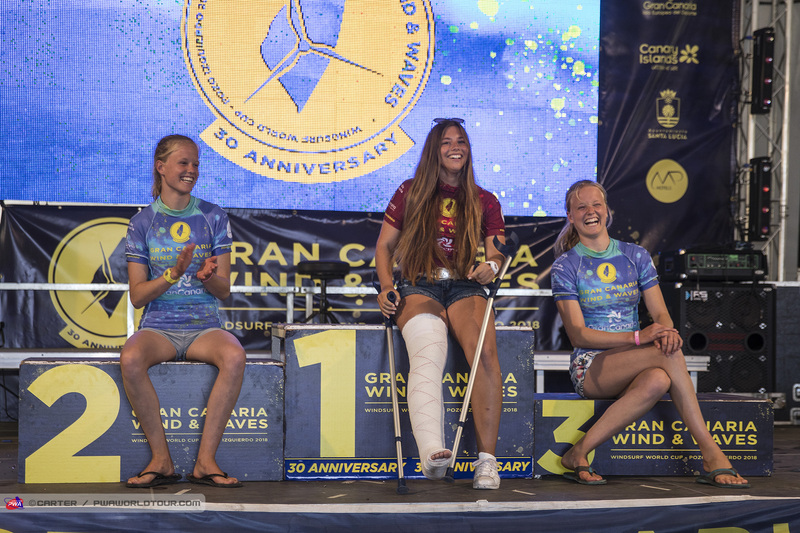 Just as the men did yesterday, the women laid down the gauntlet on Day 3 of the 2018 Gran Canaria Wind & Waves Festival as they showcased some of the highest level of female competition sailing seen - with top performances throughout the field as the standard on the women’s world tour continues to go from strength-to-strength. However, despite the girls raising the bar there was still nothing they could do, on this occasion, to stop the legendary Moreno twins - Daida (Starboard / Severne / Maui Ultra Fins) and Iballa (Starboard / Severne / Maui Ultra Fins) - from claiming the top two places in the single elimination, which was eventually won by Daida, although they both had to survive some close calls. 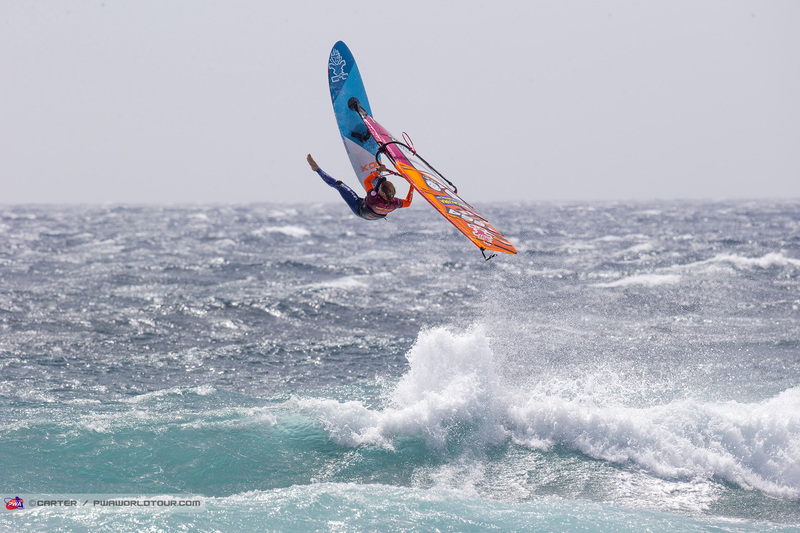 Daida Moreno (Starboard / Severne / Maui Ultra Fins) started her campaign in explosive fashion as the multiple-time world champion posted the highest scoring heat of the day - 34.99 points out of a possible 40 - to send out warning signs to her rivals. Against Oda Johanne (Starboard / Severne / Maui Ultra Fins), Daida landed a big backloop and a stalled forward, but it was her wave riding that was even more impressive as she produced an almost perfect wave score - 19.12 points out of 20 - as she landed a variety of powerful turns with frontside aerials and takas to set the tone. Daida maintained that high level of performance throughout as she dispatched of Nicole Bandini (Fanatic / Duotone) in the next heat, before holding her nerve to edge an incredibly close seminal against - Sarah-Quita Offringa (Starboard / NeilPryde / Maui Ultra Fins) - to book her place in the final. Reigning world champion - Iballa Moreno (Starboard / Severne / Maui Ultra Fins) - faced a stern first test in Heat 12b against Steffi Wahl (Sailloft Hamburg) as the German started strongly, with her powerful and aggressive wave riding really catching the eye, and it wasn’t until towards the end of the heat that Iballa was able to assert as she saved her best jump and best wave ride until last to advance. 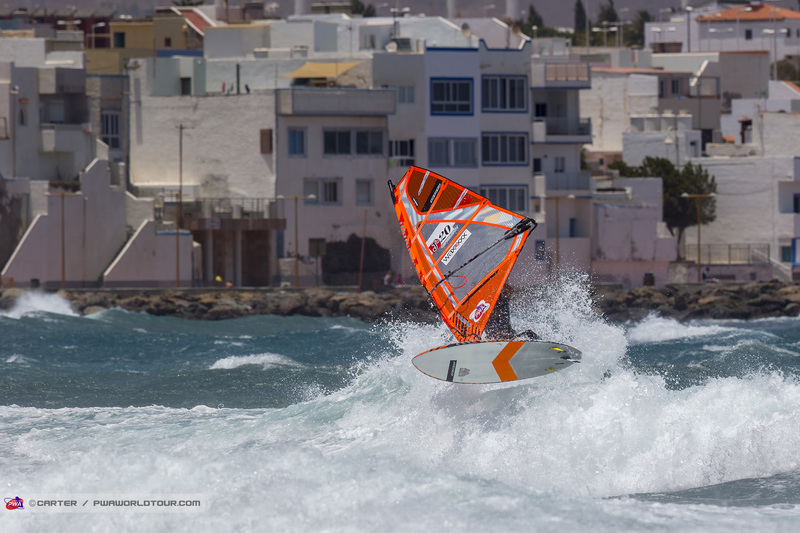 Having passed that test Iballa then saw off Arrianne Aukes (Fanatic / Duotone / Maui Ultra Fins) in the next round, before defeating Justyna Sniady (SImmer / Simmer Sails / AL360) in an exciting semifinal which saw Iballa begin with a bang - landing a big pushloop and backloop - to set up the Winners’ Final against Daida. 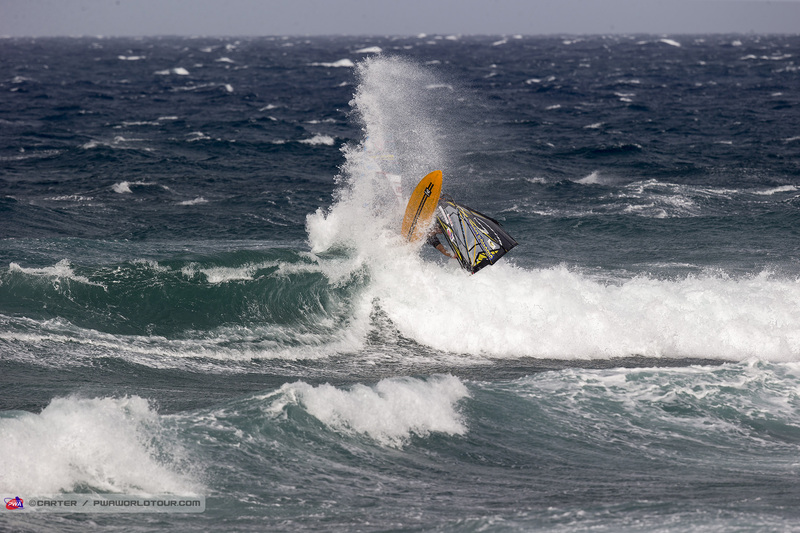 During the final, the wind cranked up another notch which left both Iballa and Daida looking fairly overpowered. Both women began strongly with Daida quickly racking up two solid wave scores - 7.12 points & 7.25 points - while Iballa landed a big clean backloop, as did Daida. With the wind picking up it became a bit of a battle to remain in control at times but Daida was able to land a powerful stalled forward, while Iballa stuck a pushloop at the third time of asking, in the final minute, to leave almost nothing between them in the jump stakes. However, Iballa, who is usually so strong and reliable on the wave struggled in the final, while, as already mentioned, Daida was able to rack up two solid waves to claim a decisive victory in the end. Sarah-Quita Offringa continues to close the gap between herself and the Moreno twins - as proved by pushing Daida all the way in the semifinal and in the end Offringa missed out by just 0.39 of a point. 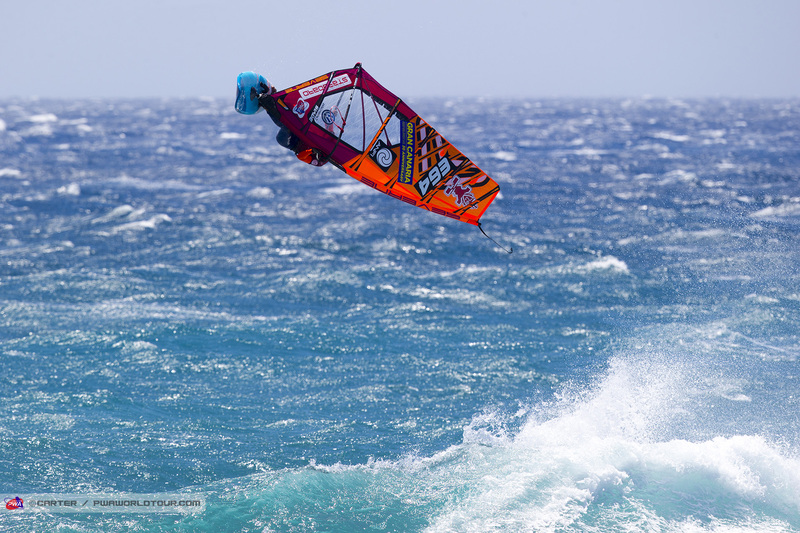 Offringa performance well throughout and seems to have tweaked pushloops dialled, which makes her an even more dangerous proposition, while her wave riding remains fluid and powerful. The 14-time world champion completes the podium for the single elimination after defeating Justyna Sniady in the battle for third and fourth, will no doubt be gagging for another shot at breaking into the top 2 and beyond. Justyna Sniady will be delighted with her day's work after the Pole produced her best performance date in a single elimination as she secured 4th place with a series of eye-catching displays. Herself and Lina Erpenstein (Severne / Severne Sails) contested some hard-fought battles last season and Sniady will be happy to have come out on top of a very tight affair today to progress into the top 4. Erpenstein had to be at her best in her first heat of the day to defeat an on form Nayra Alonso (Fanatic / Severne) and she produced the goods to do just that with a stalled forward, tweaked pushloop and some aggressive turns doing the job, so she will probably be slightly disappointed she couldn’t do the same against Sniady. 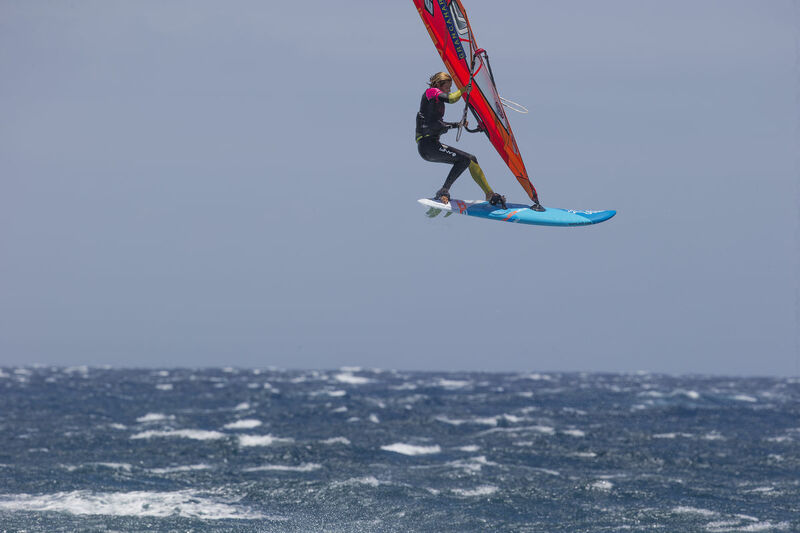 The German certainly had her chances but couldn’t land her second counting jump, so the 21-year-old has to settle for joint 5th in the single alongside Caterina Stenta (RRD / RRD Sails / Maui Ultra Fins), Nicole Bandini and Arrianne Aukes. Based on performances elsewhere in the single elimination the latter three will face extremely tough challenge to maintain their current ranking with the likes of Steffi Wahl and Nayra Alonso both looking incredibly dangerous, while Maaike Huvermann (Starboard / Severne / Maui Ultra Fins) and Oda Johanne (Starboard / Severne / Maui Ultra Fins) have shown that they have the jumping prowess to be a threat and there should be some interesting matchups to come in the double elimination. 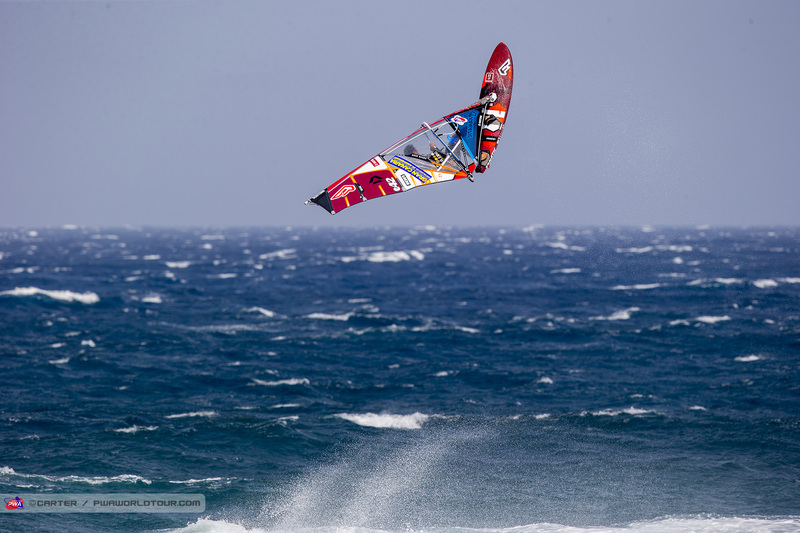 After the completion of the women’s single elimination, the men’s double elimination began as the wind continued to crank, while the swell pulsed through for a while. After a further three and half hours of competition, the opening two rounds have been completed. Moritz Mauch (Severne / Severne Sails) was involved in the first heat of the double elimination and the German produced a masterclass in wave riding to earn the first 10 of the competition after landing a fully planing goiter, frontside 360 and a frontside hack to progress. The 22-year-old then ended the hopes of Ben Proffitt (Simmer / Simmer Sails) in the next round and will now face Marc Paré (Simmer / Simmer Sails) in round 3. 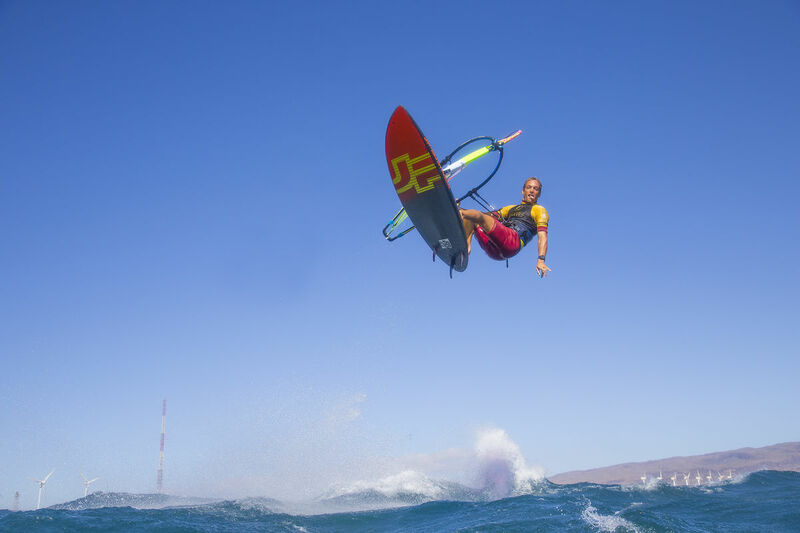 Mauch is undoubtedly one of the most sailors in terms of wave riding, but whether he can produce the jumping to trouble Paré remains to be seen. Elsewhere, Florian Jung (Starboard / Gun Sails), local boy Omar Sanchez (Carbon Art / KA Sail) and Thomas Traversa (Tabou / GA Sails) all made successful starts to their comebacks. As did Camille Juban (Quatro / Simmer Sails) after winning a tight second-round matchup against Kenneth Danielsen (Flikka / Simmer Sails), while Amado Vrieswijk is also into the third round, but will need to improve his wave riding when going up against Dieter van der Eyken (Severne / Severne Sails) in a rematch from the single. Leon Jamaer (JP / NeilPryde) may have produced the highest scoring heat of the first round - 27.87 points - but that’s as good as it got for the German, who suffered a shock defeat to the hugely talented Marino Gil (Goya Windsurfing), who caused the upset of the day. Take nothing away from the 15-year-old though as it was Gil sailing well, rather than Jamaer having a shocker, with Gil landing a massive stalled forward and a floaty backloop, while also managing to bust out a frontside 360 in the challenging conditions. 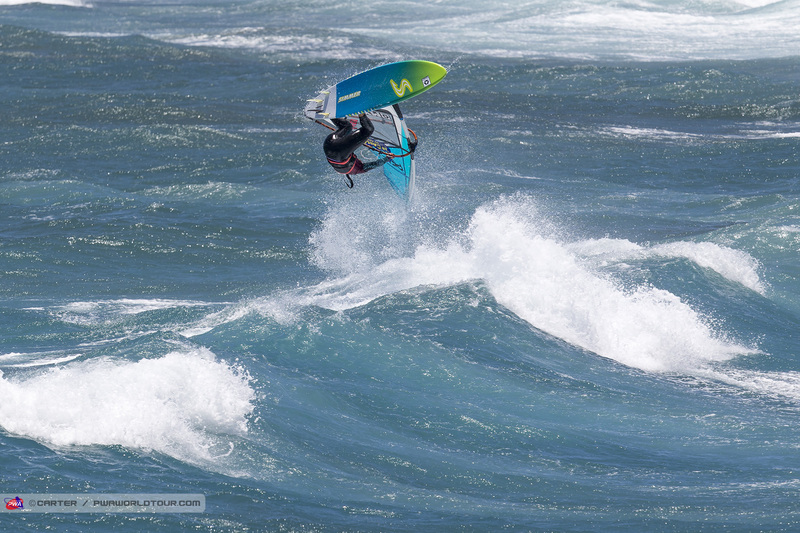 Gil is certainly one of the most exciting up and coming talents in the windsurfing world right now. 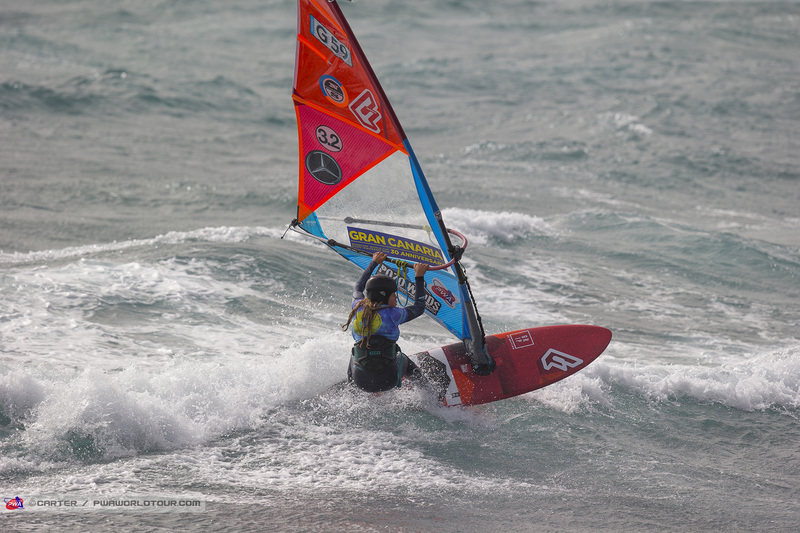 Gil wasn’t the only 15-year-old to enjoy the taste of victory though as Japan’s Takuma Sugi (Tabou / GA Sails) took down Antoine Albert (Goya Windsurfing). However, Julian Salmonn (Bruch Boards / Gun Sails) then ended the youngster's hopes and will now face Jules Denel (JP / NeilPryde). The plan was to complete the third round as well, but with the tide becoming too full the waves backed off so the decision was made to release the sailors shortly after 7pm. They will meet again at 9am tomorrow morning with the action commencing from 9:30am (GMT+1) onwards. 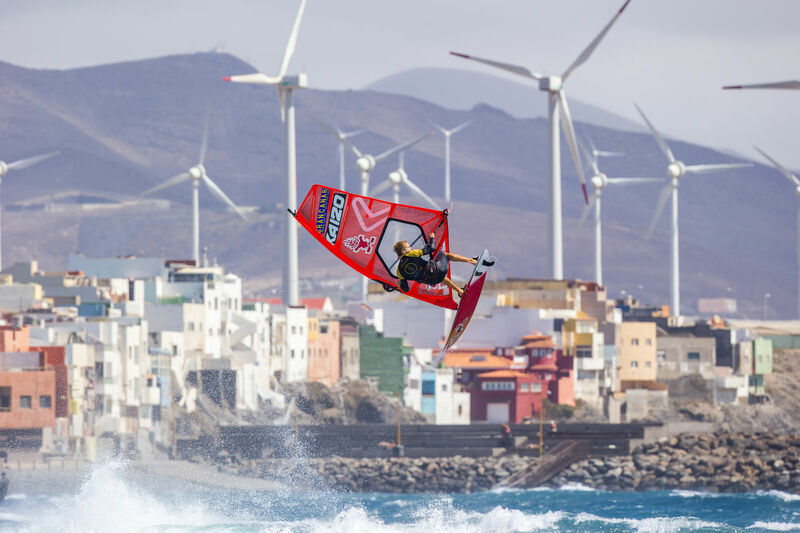 The action continued for the 4th successive day at the 2018 Gran Canaria Wind & Waves Festival as Pozo Izquierdo continued to produce the goods allowing more progress to be made through the men’s and women’s double eliminations. 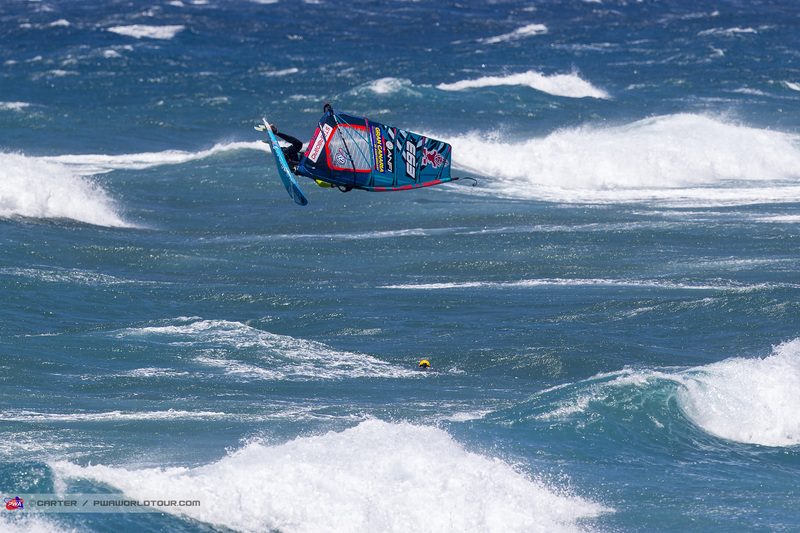 In fact, at the close of play only the top 4 men and women remain standing as the competition edges ever closer to its conclusion, but today belongs to Ricardo Campello (Point-7) and Lina Erpenstein (Severne / Severne Sails) after both sailors fought their way back into at least 4th place and they will hope to carry forward that momentum when the competition resumes. 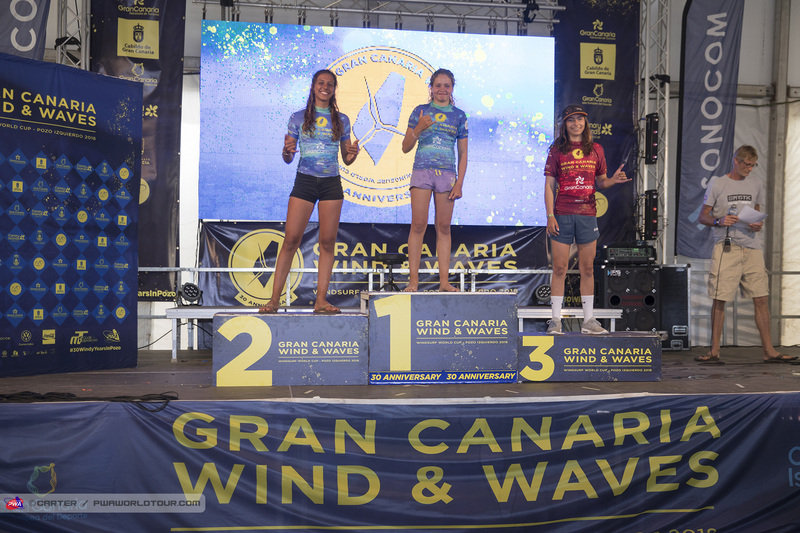 Lina Erpenstein won four heats on the bounce in the double elimination to secure at least 4th place at this year’s Gran Canaria Wind & Waves Festival. The German was able to gather some momentum today as she first brought Oda Johanne’s (Starboard / Severne / Maui Ultra Fins) comeback through the double to an end, before doing the exact same thing to Maaike Huvermann’s (Starboard / Severne / Maui Ultra Fins) hopes to setup up a tie against Nayra Alonso (Fanatic / Severne). Alonso sailed first thing this morning - receiving a bye through the first round with Line Bang Wittrup (Patrik / Sailloft Hamburg) being forced to withdraw through injury - before sailing a strong heat to dispatch of Sarah Hilder (Simmer / Simmer Sails). The Spaniard’s better wave riding then proved to be the difference between herself and Nicole Bandini (Fanatic / Duotone). And the same was also true against Steffi Wahl (Sailloft Hamburg) in Heat 30b. This morning Wahl had racked up 15 points for her wave riding in Heat 27b, but she clearly didn’t enjoy this afternoon’s slacker waves as she struggled to find the same scoring opportunities and bowed out. Erpenstein then edged a close heat against Alonso with the German progressing thanks to her jumping with the two girls almost tied on points for wave riding - meaning Alonso takes home 6th place in the double elimination. The 21-year-old then exacted revenge against Justyna Sniady (Simmer / Simmer Sails / AL360) for yesterday’s defeat to advance into the top 4, while Sniady slips one place to 5th. Erpenstein will face Sarah-Quita Offringa (Starboard / NeilPryde / Maui Ultra Fins) next in the battle for 3rd and 4th. The PWA would also like to wish Lena Erdil (Starboard / Point-7 / AL360 / Chopper Fins) a speedy recovery after the Turk suffered a suspected broken metatarsal this morning upon landing a forward. 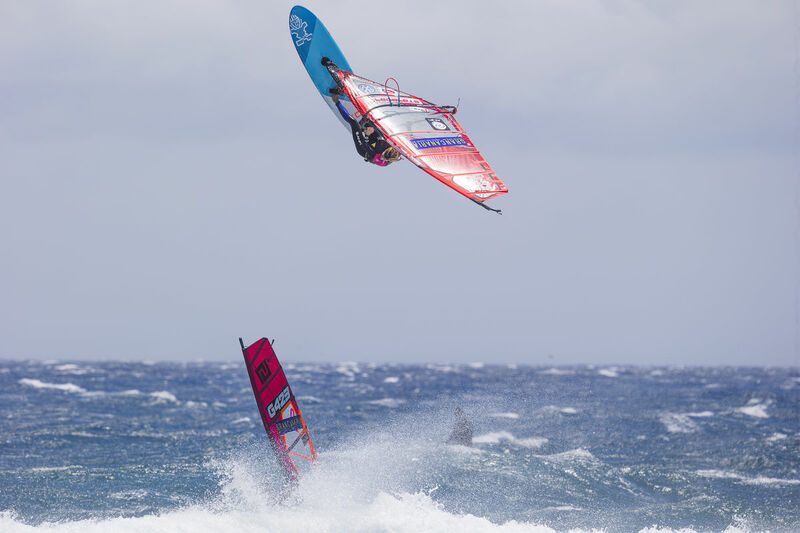 Ricardo Campello is still alive and kicking in the double elimination after winning 4 consecutive heats - although it wasn’t always plain sailing. Campello brought Dieter van der Eyken’s (Starboard / Severne) comeback to an end with a relatively straight forward victory, however, heading into the last minute against Adam Lewis (Fanatic / Duotone / SWOX) the 33-year-old was staring defeat in the face with the two sailors tied on points. The Brit would’ve won the tiebreak on highest single wave score, but unfortunately for Lewis, Campello pulled out his highest scoring wave of the heat in the final minute to perform a buzzer beater - leaving Lewis to settle for joint 7th, while Campello marched on. Next up for Campello was Jaeger Stone (Starboard / Severne / SWOX / Shamal Sunglasses) and these two produced the heat of the day. 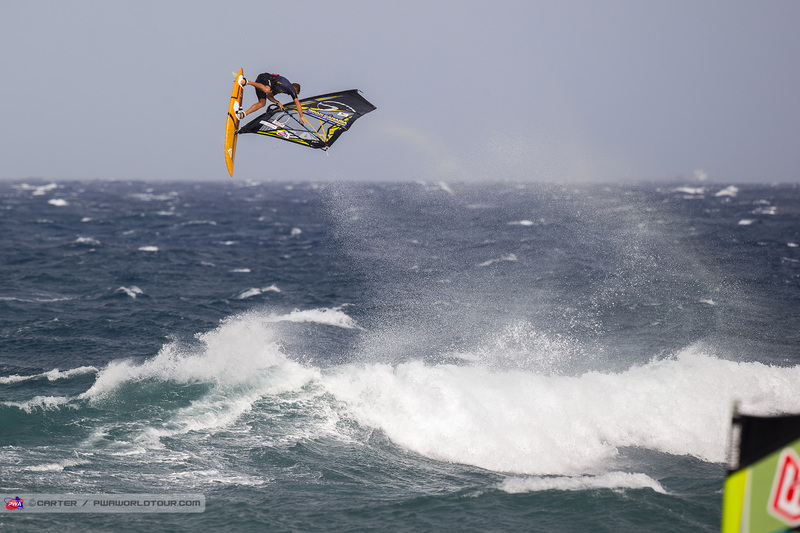 It was Stone who made the much brighter start with a one-hand, one-foot backloop and a 7.88 point wave score on his first wave, while Campello had no telling score after 5 minutes with only a crashed pushloop forward to count. In the past Campello has become flustered and can often visually appear quite negative mentally after a less than ideal start, but not this time as he fought back with a perfect double forward and a pushloop forward, while land frontside 360s and powerful turns to progress. 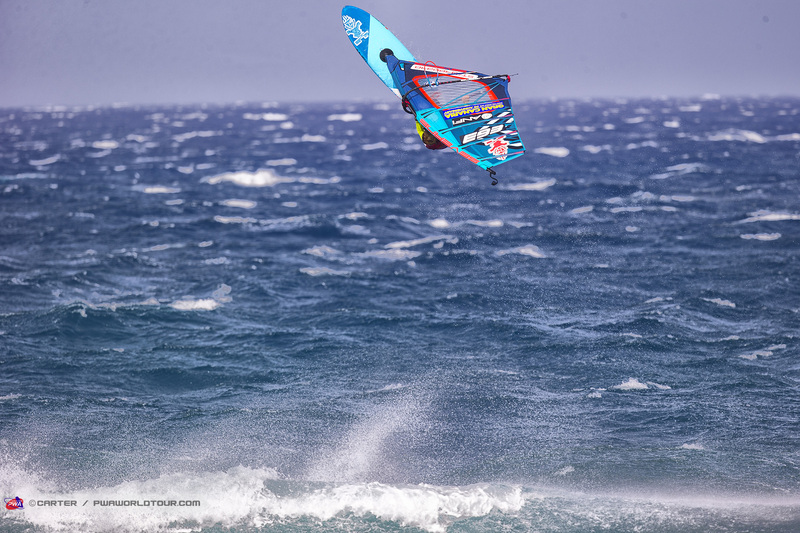 Campello then dispatched of Alex Mussolini (RRD / RRD Sails) in what proved to be the final heat of the day and will face Victor Fernandez (Fanatic / Duotone / Shamal Sunglasses) in a rematch from the single elimination. Stone finishes the double elimination in 6th place after defeating Marc Paré (Simmer / Simmer Sails) and Jose ‘Gollito’ Estredo (Fanatic / Duotone), while losing out to Campello by just 0.69 of a point. The Australian excelled with his powerful and dynamic wave riding earning 4 wave scores of 7.75, 8.62, 8.10 and 7.75 from 6 waves, but crucially couldn’t land a push forward in these conditions to keep his hopes alive this time around - although you could see he wanted it with his final jump attempt. If Stone can learn to land push forwards in a wider variety of conditions then there is no doubt he would be a genuine title contender as his wave riding is second to none. *Of the remaining top 4 only Victor Fernandez (Fanatic / Duotone / Shamal Sunglasses) has not landed a pushloop forward. Elsewhere, Jose ‘Gollito’ Estredo produced the highest scoring heat of the day (at the time) - 30.54 points - in Heat 44b against Robby Swift (JP / NeilPryde / SWOX) to earn his first top 10 finish in the waves - joint 7th alongside teammate Adam Lewis. Meanwhile, the top 10 is completed by Marc Paré, Robby Swift, who landed an insane pushloop forward to kick start himself against Josep Pons (Simmer / Simmer Sails) before landing a last second frontside 3 to beat the local boy, Dieter van der Eyken (Severne / Severne Sails), who defeated Camille Juban (Quatro / Simmer) in the dying seconds, and Dany Bruch (Bruch Boards / Flight Sails / AL360 / Shamal Sunglasses). The forecast for tomorrow suggests slightly lighter winds and smaller waves, so the decision has been made to prioritise the Youth fleets for the morning at least. They will meet for a 9am skippers’ meeting, while the men’s and women’s skippers’ meeting will be held at 2pm tomorrow afternoon - with a first possible start at 2:30pm (GMT+1). 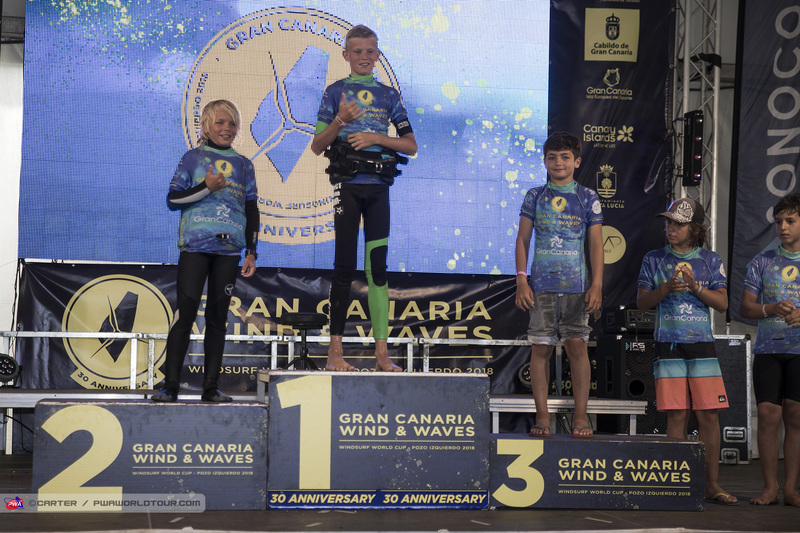 The opening two eliminations for the girls (U13+U5, U17, U20) and the boys (U13) were completed on Day 5 of the 2018 Gran Canaria Wind & Waves Festival as the Youth’s took centre stage for the first time this week, while the pro’s enjoyed a much deserved rest after 4 hectic first days. 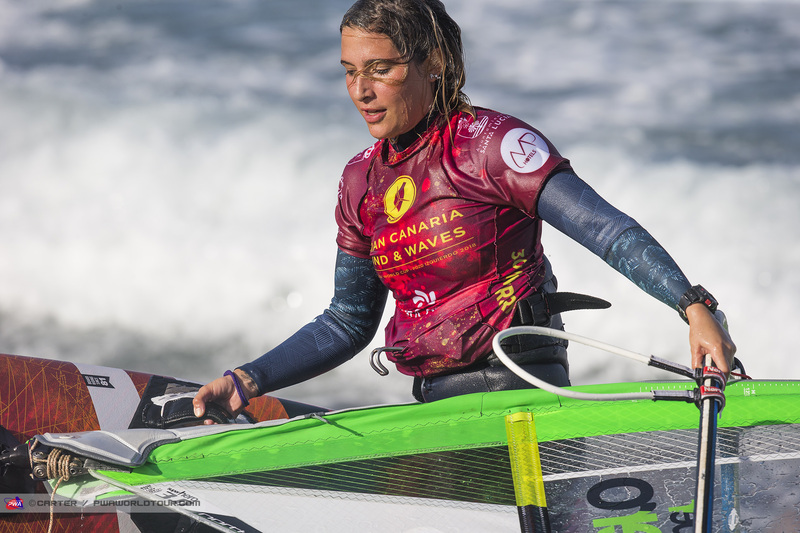 Alexa Kiefer Quintana (Fanatic / Duotone) is in complete control of the Under 13 + 15 bracket after claiming two decisive victories ahead of Maria Morales Navarro (Goya Windsurfing), 2nd, Isabel Triviño Delgado (Fanatic / Goya Windsurfing), 3rd, Lucia Triviño Delgado (Starboard / Goya Windsurfing), 4th, with both her wave riding and jumping being on a different level. After identical results in the two eliminations the ranking looks unlikely to change if there is further competition. Mar de Arce (Loftsails) won the opening final in the girls U17s after landing a backloop to see off Julia Pasquale (Fanatic / Duotone) and Alexa Kiefer Quintana, who qualified for the U17s Final after winning the U13 + U15s. Kiefer Quintana may not have been able to make as much of an impression as she may have liked in the opening final, but she more than made it for that by winning the second final, meaning herself and Mar de Arce are currently tied on 3.7 points, while Julia Pasquale is still in the mix for top spot on 4 spots. Just as in the U13+15 division - Alexa Escherich (JP / NeilPryde) looks to have the competition all but seen up after sailing to two decisive victories ahead of Tessa van der Meer , 2nd , Nikki van der Meer, 3rd, Regina Villegas Cespedes (Duotone), 4th. Tobias Bjørnaa (Fanatic / Duotone) was the standout in the Under 13 Boy’s category as he won both finals with his wave riding in particular catching the eye - although he also landed some excellent forward loops. 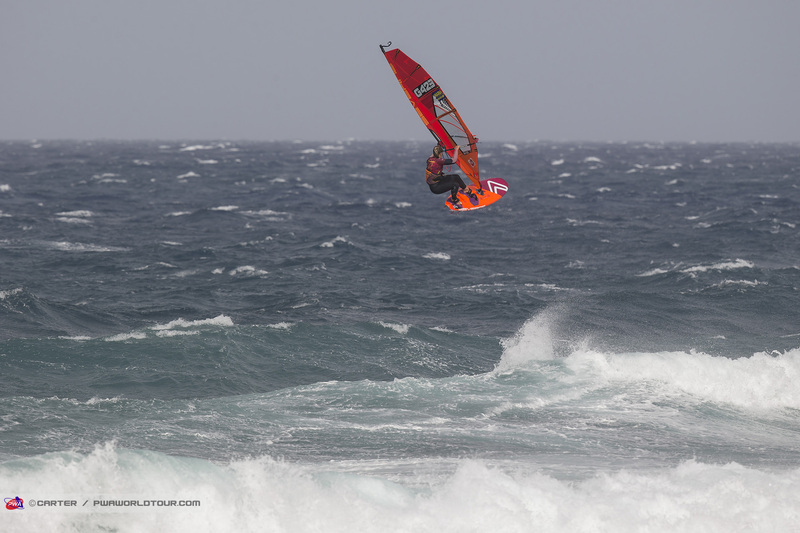 Meanwhile, Pepe Krause (Quatro / Hot Sails Maui) holds 2nd place after a 3rd and 2nd place ahead of Carlos Kiefer Quintana (Fanatic / Duotone), Giulio Gasperini (Starboard / Severne) and Marco Alonso Camara (Ezzy). Jahdan Tyger (Severne / Severne Sails) had to come through the repechage in the first U15s elimination, but has successfully qualified for the final where he will line up against Liam Dunkerbeck (Starboard / Severne), Lennart Neubauer (Starboard / Severne), who sailed a great heat, and Alex Di Giosafatte (I-99 / Challenger Sails). Only the top 4 sailors remain in the Under 17s… Marino Gil (Goya Windsurfing), who finished 17th in the main draw won the first semifinal ahead of Mike Friedl (Goya Windsurfing), while Takuma Sugi (Tabou / GA Sails) and Corto Dumond (Tabou / GA Sails) qualified from the second semifinal. Meanwhile, after 10 heats in the U20 division only the top 4 sailors remain - Jake Schettewi (JP / Hot Sails Maui), Valentino Pascquale (Fanatic / Duotone), Miguel Chapuis (JP / NeilPryde) and Adam Warchol (Goya Windsurfing). The finals will probably be completed on Friday, although all fleets will meet at 9am tomorrow morning with a first possible start at 9:30am (GMT+1). 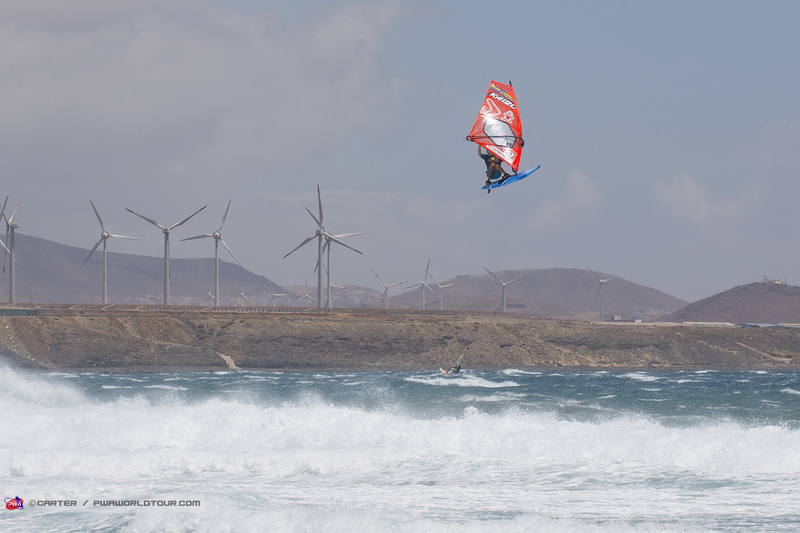 The penultimate day of the 2018 Gran Canaria Wind & Waves Festival saw Pozo Izquierdo continue to produce howling winds and waves. 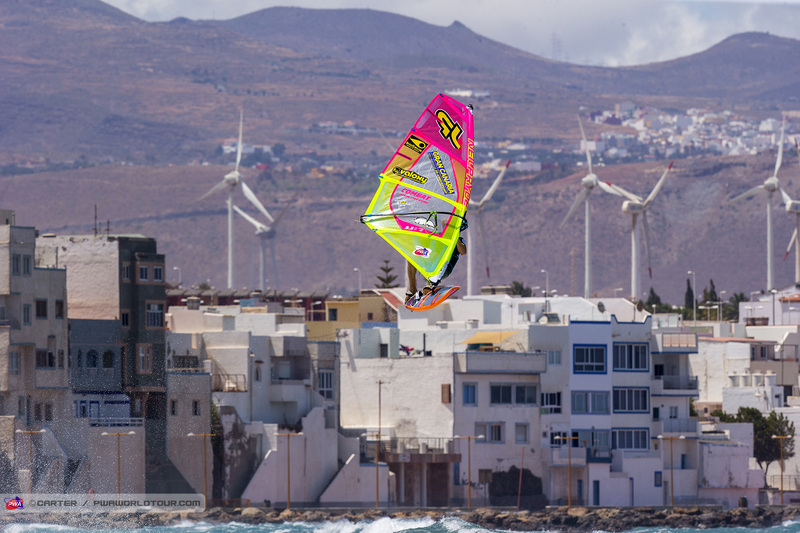 In the morning the Youth’s contest was completed in lighter winds, while one women’s heat was finished just before 1pm before the remaining competitors were placed on hold for 4 hours. After playing the waiting game, the waves began to improve with the tide on the push, while the wind cranked up an extra notch or two to provide an amazing end to the day and heading into Saturday only the top two sailors in both the men’s and women’s draw remain. Sarah-Quita Offringa (Starboard / NeilPryde / Maui Ultra Fins) will line up in the Women’s Final tomorrow against Daida Moreno (Starboard / Severne / Maui Ultra Fins) after winning both of her heats today. 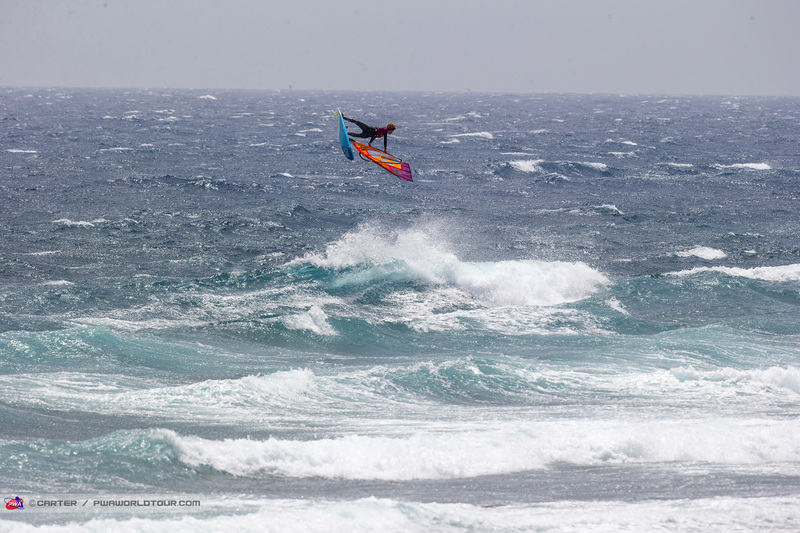 The Aruban produced an excellent performance against Lina Erpenstein (Severne / Severne Sails), which included a sick tweaked pushloop and a backloop to set up a tie against Iballa Moreno (Starboard / Severne /Maui Ultra Fins). Erpenstein meanwhile made a solid start to the heat with a stalled forward, but then struggled to build on that and bows out in an excellent 4th place in the second women’s event of the year. Sarah-Quita Offringa then took down reigning world champion - Iballa Moreno - in Heat 34 after a hard fought battle, which saw the lead switch hands on a couple of occasions. Iballa scored her best wave of the heat on her opening wave as she linked a backside air with two fluid frontside turns to earn 6.62 points. 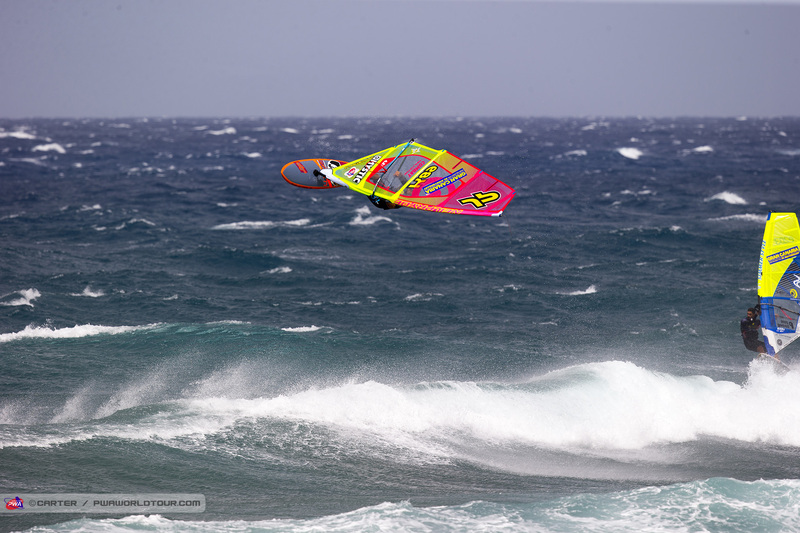 Meanwhile, Offringa was able to land a stylish tweaked pushloop again and moved into the lead with a couple of low wave scores, which made her vulnerable. 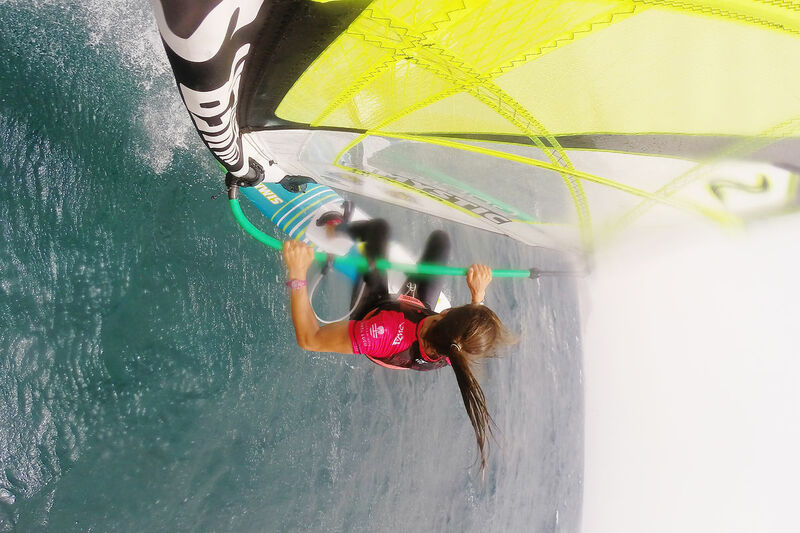 After changing down sail size, Iballa was then able to find the ideal ramp to launch into, and land, a high backloop, which sent her into the lead. 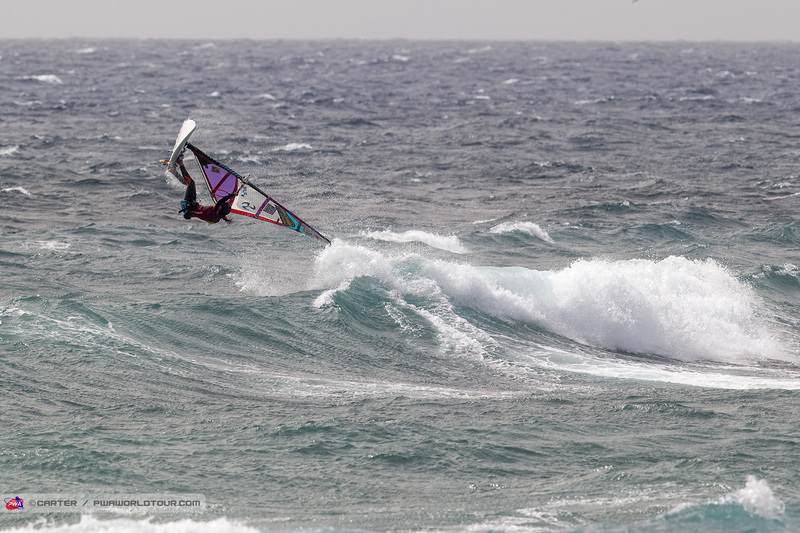 However, her advantage was short-lived as Offringa almost immediately landed a perfectly clean backloop - but much lower - to regain the lead and then did her best work on the wave with her final 3 waves. Iballa’s strongest part of her sailing is usually her wave riding, but after a solid start she was unable to find another wave score above 1.12 points - which is perhaps testament to how tough the conditions were - but she will also be a bit gutted knowing that ‘just’ a 4.25 point wave or better would’ve seen her defend her second place. 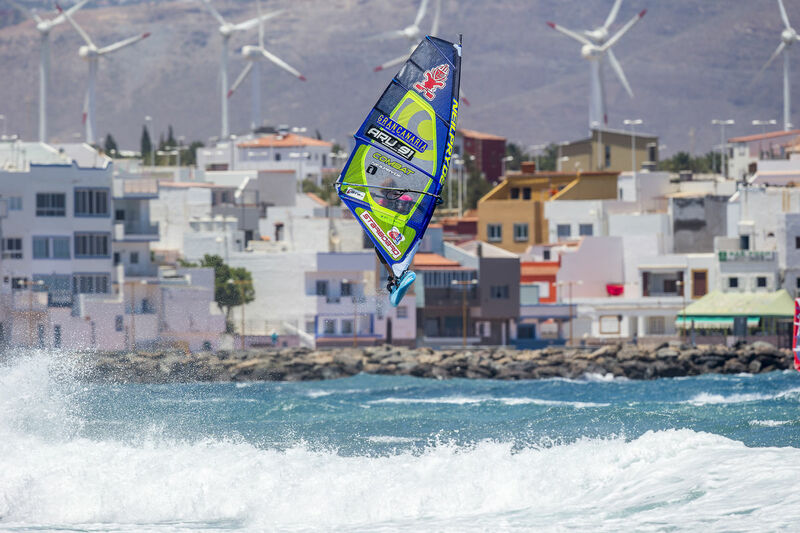 Ricardo Campello (Point-7) produced a superb performance in Heat 49 to overcome his nemesis Victor Fernandez (Fanatic / Duotone / Shamal Sunglasses), who for the first time in 11 years, not only misses out on a place in the top two, but also on the podium, with Campello moving into the top 3. 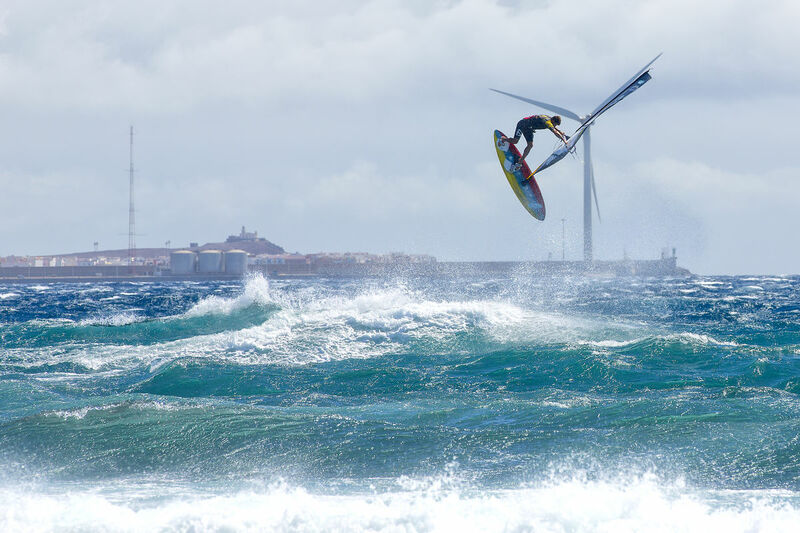 The 33-year-old earned an almost perfect 19 points out of 20 for his jumping after landing an amazing pushloop forward and a stalled double forward while earning two wave scores of 8.12 and 7.88 points to leave Fernandez almost helpless, which is unheard of - especially in Pozo. The Spaniard made a fine start to the heat with a perfect double forward of his own, and an 8.38 point wave, but clearly knew he was in trouble as he attempted two pushloop forwards, but to no avail. 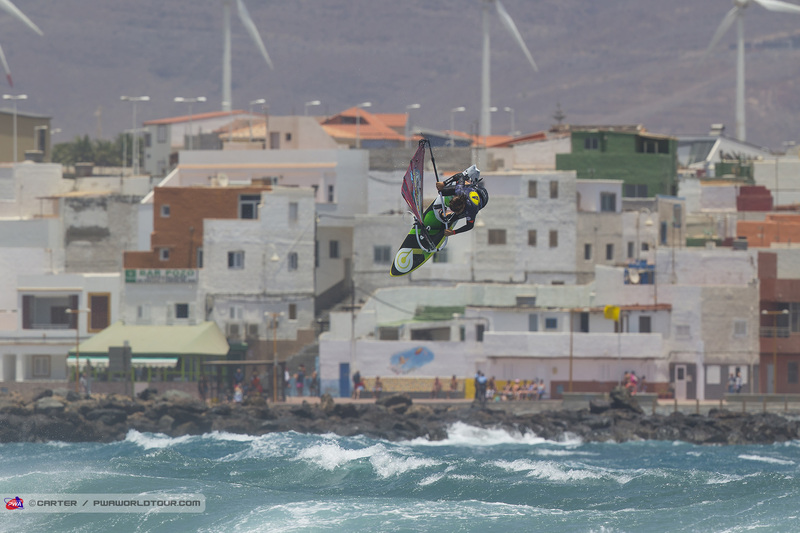 Campello then faced good friend Marcilio Browne (Goya Windsurfing) in the battle for second and third, which saw a great battle unfold. Both sailors landed excellent double forwards while racking up similar wave scores in the early stages to leave the duel delicately poised. 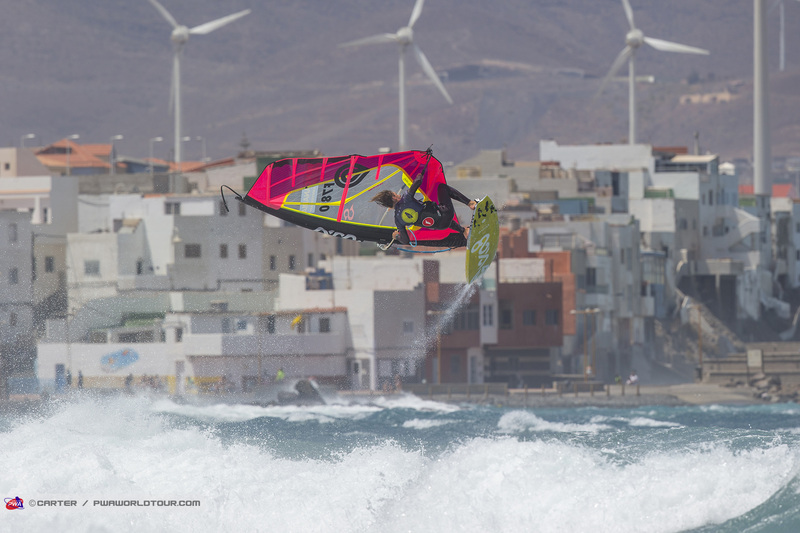 However, with just a couple of minutes to go, it looked as though Campello had won the heat as he finally found the ramp he was looking for to land a now trademark pushloop forward and with hardly any time to respond it looked like Campello would continue his march back through the double. However, Browne had different ideas and the Brazilian went for broke in the last minute as he landed the first double forward off the lip in a competition before adding one or two backside turns, which turned the heat in his favour and claim victory by just over half a point, while stunning Campello. 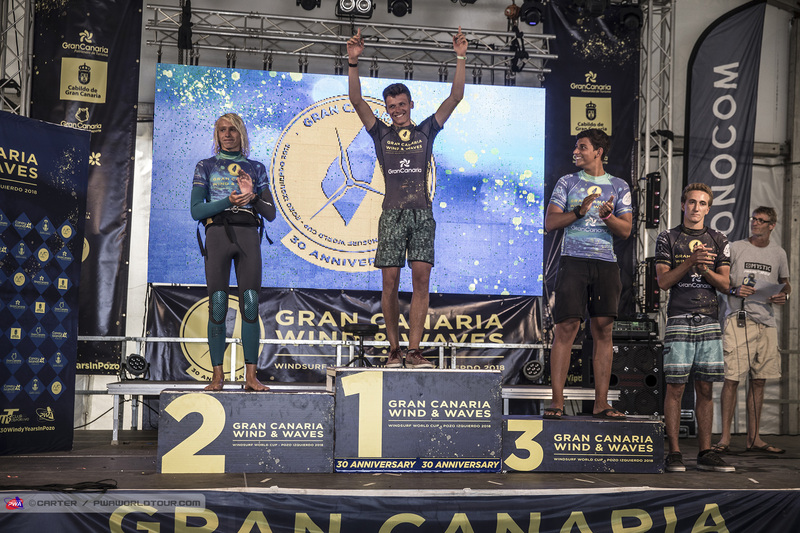 Upon hearing the result, Campello was perplexed that his first two wave scores hadn’t been scored as one wave as he felt he had continued to ride the same wave, but those pleas fell on deaf ears leaving him to settle for third place at this year’s Gran Canaria Wind & Waves Festival. The stage is now set for tomorrow, which will see a grandstand finale in both the men’s and women’s with only the top two sailors in each division left standing. 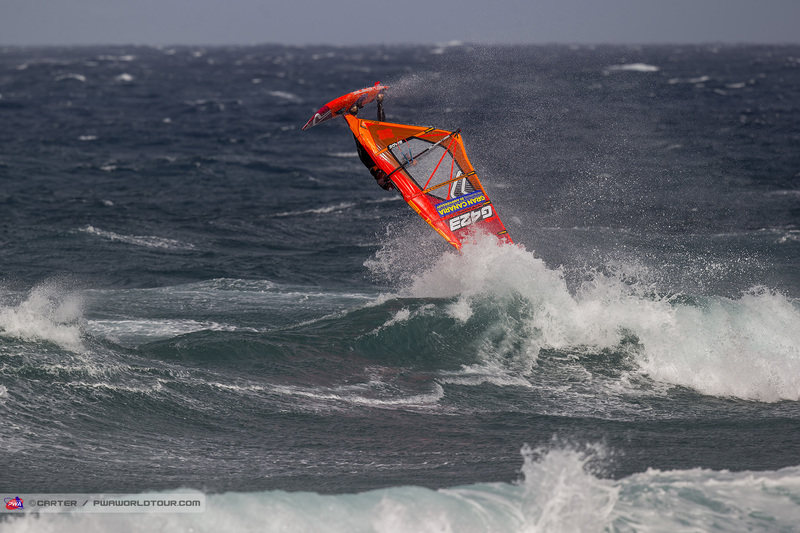 In the men’s Philip Köster (Starboard / Severne / Maui Ultra Fins) will sail against Marcilio Browne, while Daida Moreno will face Sarah-Quita Offringa. And remember if Browne and Offringa want to dislodge the single elimination winners’ from there throne then they will have to beat Köster and Daida not only once, but twice. Alexia Kiefer Quintana (Fanatic / Duotone) completed a clean sweep today by winning the third final of the contest ahead of Maria Morales (Goya Windsurfing), but today’s final was quite so straightforward as she started on the wrong size sail. However, once on the right setup she sailed straight out and landed a clean forward loop to take the top spot with a perfect record. 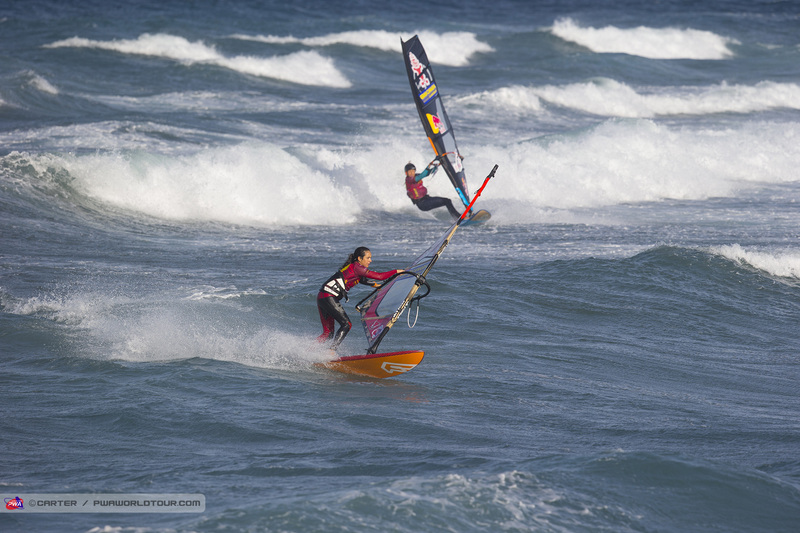 Alexia Kiefer Quintana’s day then got even better as she won the U17s category ahead of Julia Pasquale (Fanatic / Duotone) and Mar de Arce (Loftsails). Despite not being able to sail today, due to injury, Alexa Escherich (JP / NeilPryde / Maui Ultra Fins) just held on to take the overall victory in the under 20s having won both finals yesterday. Meanwhile, Tessa van der Meer finishes second ahead of her sister Nikki van der Meer and Regina Villegas Cespedes (Duotone). Tobias Bjørnaa (Fanatic / Duotone) just held on to the No.1 spot in the overall rankings after a somewhat surprising 4th place finish today - having won both finals yesterday. 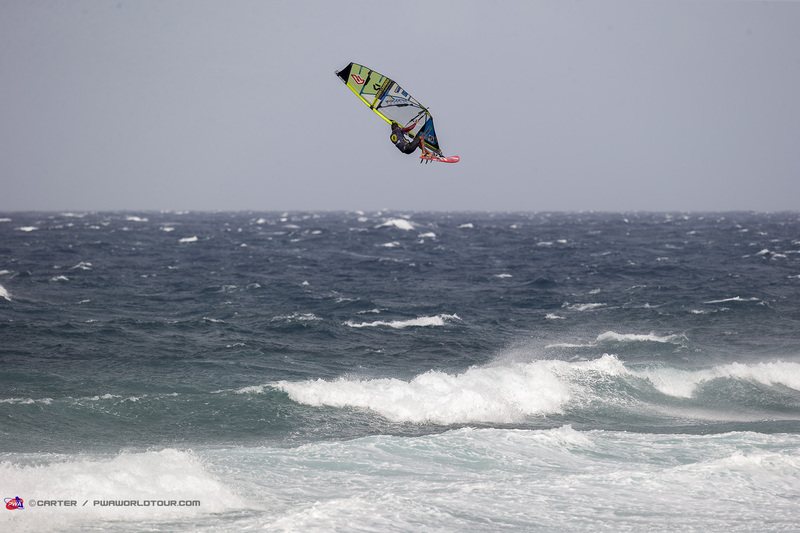 Pepe Krause (Quatro / Hot Sails Maui) won today’s final and finishes just 0.3 of a point behind Bjørnaa, while the top 3 is completed by Carlos Kiefer Quintana (Fanatic / Duotone). The under 15s division saw a hotly contested final with backloops, forwards and some quality wave riding impressing the crowd and the judges. 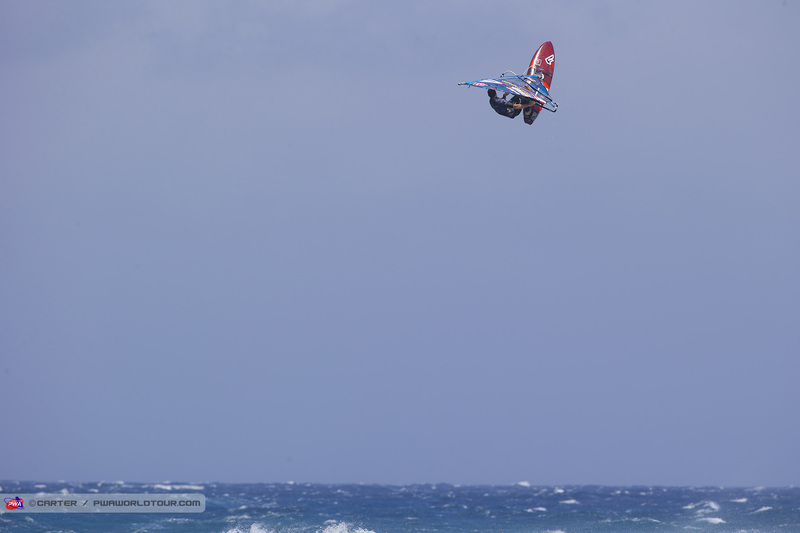 In the end though it was Lennart Neubauer (Starboard / Severne), who takes the victory just ahead of Liam Dunkerbeck, who was missing a cleanly landed second jump, (Starboard / Severne), Jahdan Tiger (Severne / Severne Sails) and Alex Di Giosafatte (I-99 / Challenger Sails). Marino Gil (Goya Windsurfing), who finished 17th overall in the Men’s main draw, claimed a deserved victory in the U17s division, but it was quite a tight affair with Corto Dumond (Starboard / GA Sails) and Takuma Sugi (Tabou / GA Sails) - not far behind - and both excelled on the wave with Sugi earning the highest wave score in the final after landing a frontside aerial. However, Gil’s superior jumping proved to be the difference. 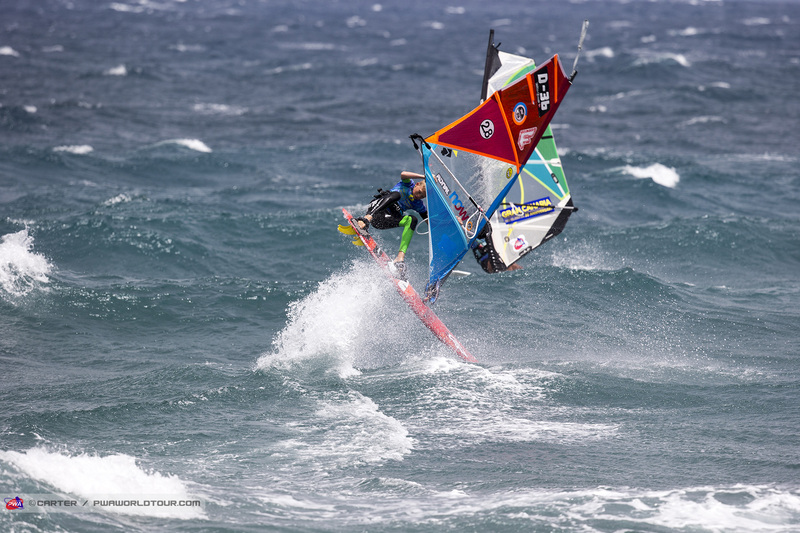 Miguel Chapuis (JP / NeilPryde) sailed a superb final to claim a clearcut victory ahead of Adam Warchol (Quatro / Goya Windsurfing), Valentino Pasquale (Fanatic / Duotone) and Jake Schettewi (JP / NeilPryde). 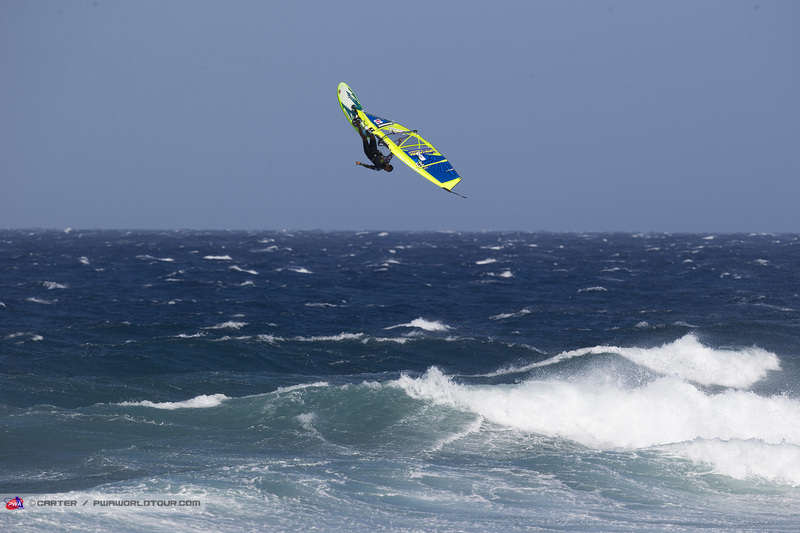 Chapuis landed a sick tweaked pushloop and a one-handed backloop, while linking together a couple of solid waves to take top honours here. The forecast looks as though the nuclear winds will continue, while the swell is expected to increase slightly overnight. The skippers’ meeting has been called for 10am with the action commencing from 10:30am (GMT+1) onwards. 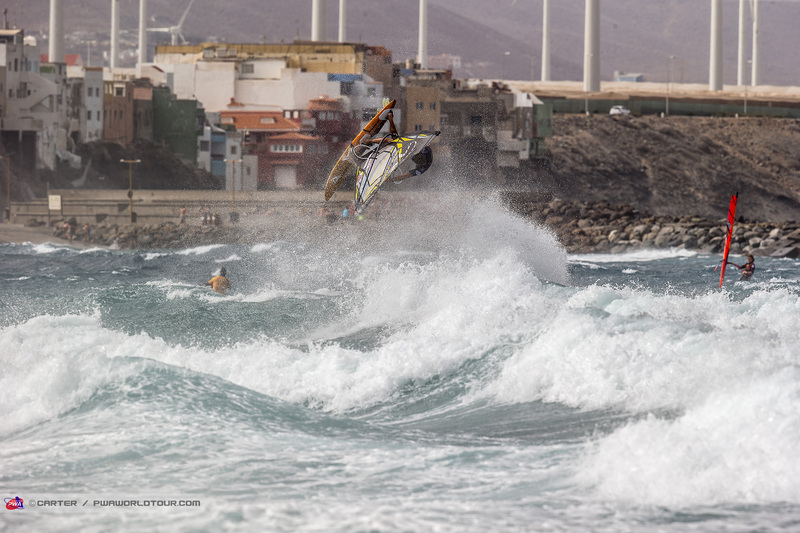 Pozo Izquierdo delivered more wind and waves for the final day of the aptly named Gran Canaria Wind & Waves Festival to deliver a fitting end to what has been an epic event. The last day was billed as Super Saturday with only the men’s and women’s finals left to run and it lived up to those expectations with winds in excess of 45 knots allowing Daida Moreno (Starboard / Severne / Maui Ultra Fins), Sarah-Quita Offringa (Starboard / NeilPryde / Maui Ultra Fins), Philip Köster (Starboard / Severne / Maui Ultra Fins) and Marcilio Browne (Goya Windsurfing) to launch into gravity-defying stunts one last time. Daida Moreno admitted that she was feeling the pressure before the final with Sarah-Quita Offringa sailing brilliantly to reach the final and having nothing to lose, and everything to gain. However, by the way Daida sailed you would never have known she was feeling any pressure at all as she produced a faultless, world-class performance to claim an empathic victory. On her first run, the multiple time world champion landed a one-handed backloop all the way, before launching in a massive regular backloop before later adding a big stalled forward and a tweaked pushloop, but saved the best until last to complete her jumping score sheet with a sick one-foot backloop to earn 8.62 points. 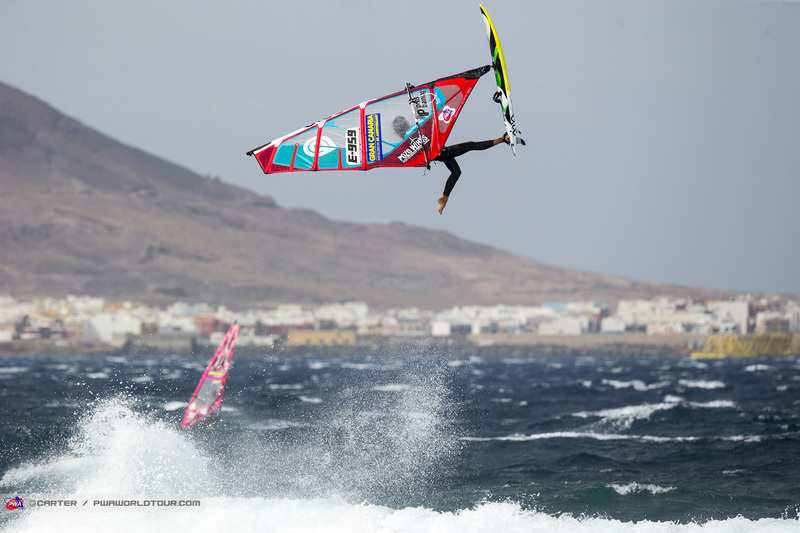 Two wave scores of 7 and 7.62 points built her an unassailable lead as she once again demonstrated exactly why she is the Queen of Pozo - and on a different level here. Offringa certainly didn’t sail badly, and will still be happy to walk away with second place, but she was powerless to stop Daida today. 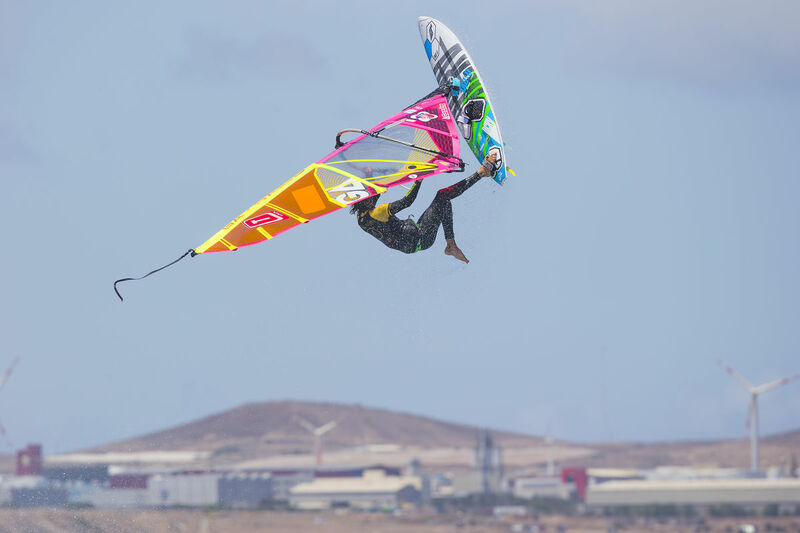 Offringa was still able to land a tweaked pushloop and a forward, while her best wave earned 6.38 points, but she never quite looked to be on the right sail size… underpowered on 3.0m and then overpowered on 3.3m as the crazy winds, which Pozo Izquierdo is famed for continued. 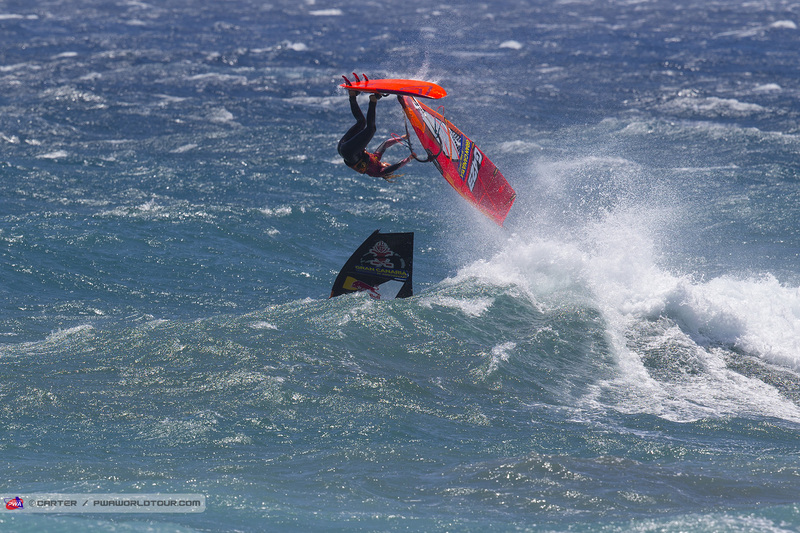 Philip Köster (Starboard / Severne / Maui Ultra Fins) produced a world-class jumping performance consisting of an insane 10 point stalled double forward, a pushloop forward and a planing one-hand, one-foot planing backloop with a double kick to earn 25.77 points out of a possible 30, while the 4-time world champion also pulled the trigger on the triple forward - the second time he has done so during the GCWWF - and wasn’t a million miles away from landing it. That resulted in Köster slightly chipping his tooth and having a headache, but a hugely deserved victory should soften that pain and it was great to see Köster trying to drive the sport forward again. 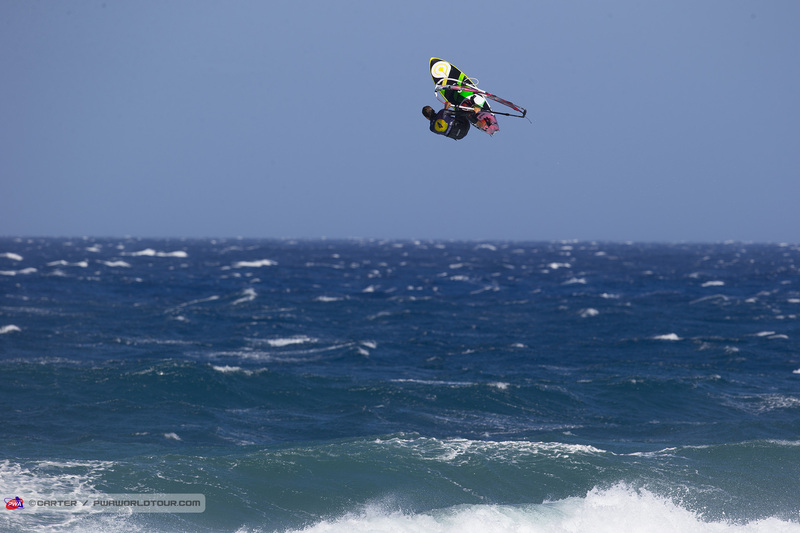 However, although he landed an amazing forward off the lip, Köster’s highest scoring wave was a 6.5, which left him slightly vulnerable to Marcilio Browne (Goya Windsurfing), who also landed a perfect double forward and a high one-foot backloop, and the Brazilian very nearly produced the wave scores he required to force a Super Final as he earned 7.88 and 8.88 points with his last two waves - after landing both front and backside 360s. However, it wasn’t quite enough as Browne lost by just 0.31 of a point. 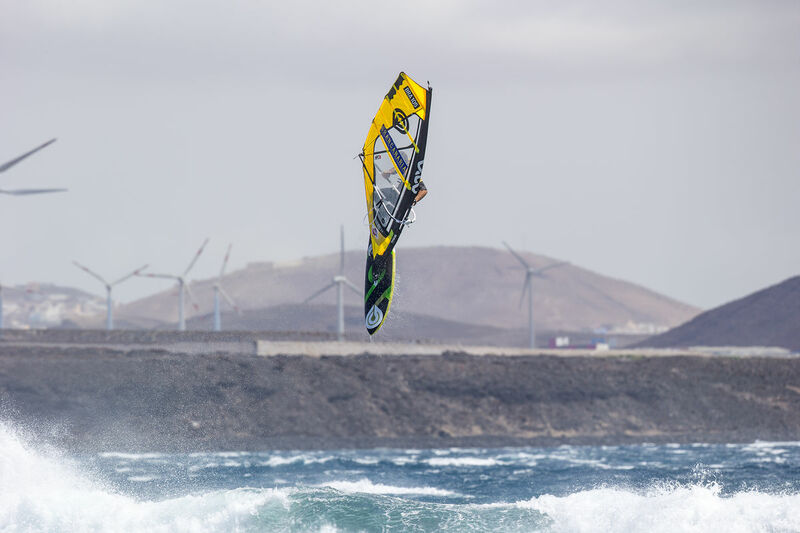 Browne will still walk away extremely happy after making qualifying for his first finalsl in Gran Canaria and therefore makes his best start to a wave season so far. We’ll take a full look at the result in the event summary on Monday. 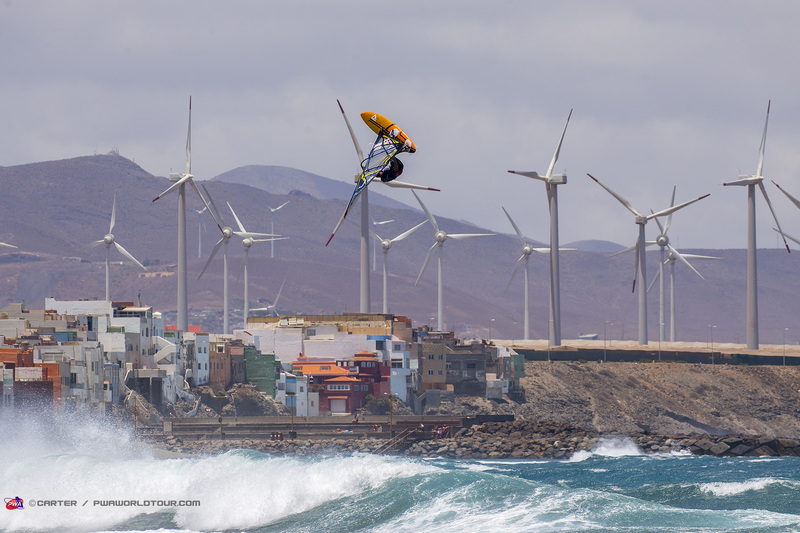 This year’s Gran Canaria Wind & Waves Festival marked the 30th anniversary of PWA World Cups in Gran Canaria and there couldn’t have been a more fitting tribute with Pozo Izquierdo providing the howling winds it is known for - in excess of 50 knots on several days - plus waves every day to allow the most radical sailors in the world to produce a gravity-defying set of displays. 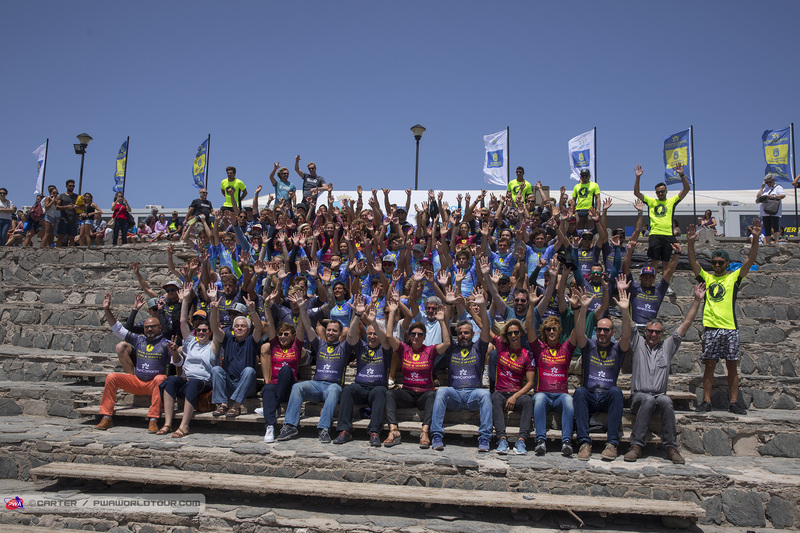 The action over the last 7 days has been phenomenal with the level going through the roof, but in the end Daida Moreno (Starboard / Severne / Maui Ultra Fins) and Philip Köster (Starboard / Severne / Maui Ultra Fins) deservedly walk away with the No.1 spot in the women’s and men’s fleets. 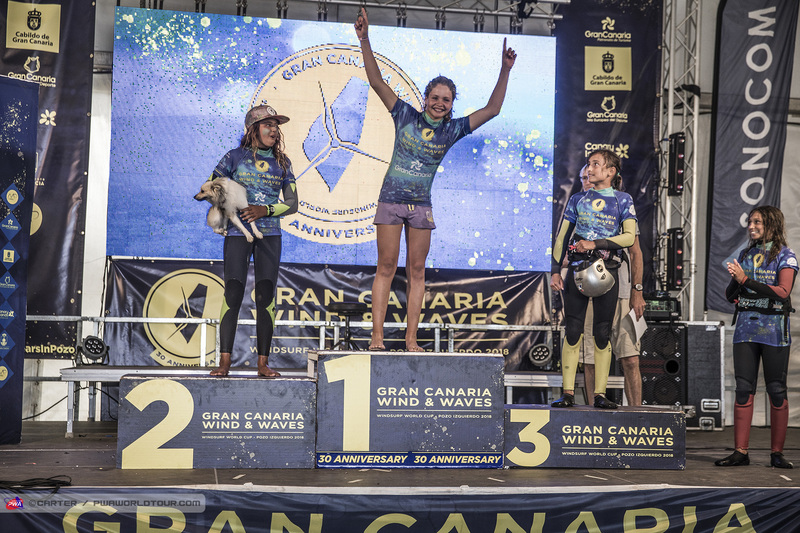 Having won every year in Pozo Izquierdo since 2000 - apart from 2012 - Daida Moreno (Starboard / Severne / Maui Ultra Fins) - entered the 2018 Gran Canaria Wind & Waves Festival as the undoubted favourite, and she showed why she has been so dominant here over the course of her career as Daida produced one of her best performances in recent years during the double elimination final against - Sarah-Quita Offringa (Starboard / NeilPryde / Maui Ultra Fins) to further enhance her reputation as the Queen of Pozo. Daida admitted that she may have been feeling the pressure before the final with Offringa sailing better than ever, but she never showed any signs of it as she gave a jumping masterclass with a massive regular backloop, one-handed backloop all the way, one-footed backloop, tweaked pushloop and a trademark stalled forward all being landed in a faultless performance. Victory here also sees Daida head to the top of the overall rankings. Offringa, meanwhile equals her best result here since 2016 after managing to gain one position in the double elimination as she first ended Lina Erpenstein’s (Severne / Severne Sails) comeback, before claiming an impressive victory against reigning world champion - Iballa Moreno (Starboard / Severne / Maui Ultra Fins) to move into 2nd place. The Aruban only managed to finished 5th here last year, but after two, second places so far this season, the 27-year-old is firmly in contention for the title with two events to go as she is currently tied on 19,800 points with the Moreno twins. Iballa Moreno may be slightly disappointed to have slipped one position from the single elimination, but even so, she remains firmly in contention for a 5th consecutive world title. Iballa had her chances against Offringa - only needing a second wave score of 4.25 points or better - but very uncharacteristically for her, she struggled to find that second wave score, when normally it is her wave riding that sets her apart. Still, Iballa will head into Tenerife in joint 1st place and she hasn’t finished outside the top 2 since 2011, while also recording 3 victories during that time. 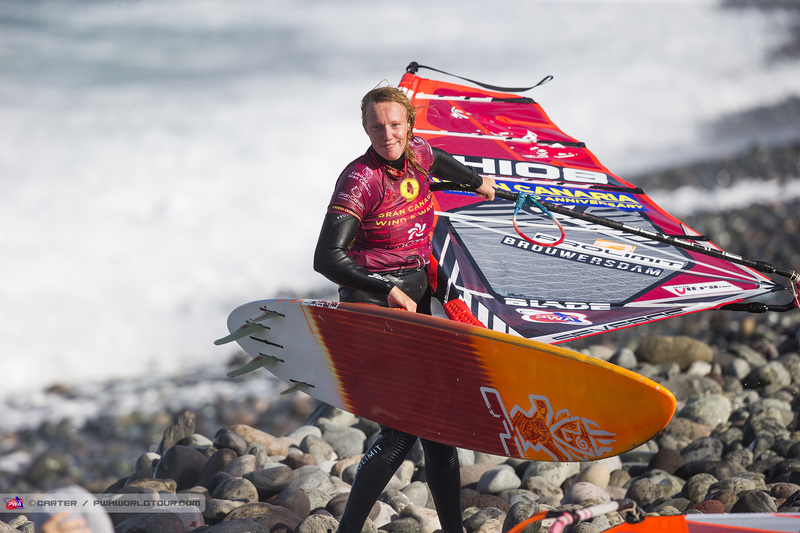 Lina Erpenstein managed to fight back to 4th place in the double elimination after winning 4 heats on the bounce against - Oda Johanne (Starboard / Severne / Maui Ultra Fins), Maaike Huvermann (Starboard / Severne / Maui Ultra Fins), who finishes in joint 7th, Nayra Alonso (Fanatic / Severne), and finally Justyna Sniady (Simmer / Simmer Sails / AL360), who finishes in 5th place, but broke into the top 4 of the single elimination for the first time, before Sarah-Quita Offringa brought her comeback to an end. Meanwhile, Nayra Alonso and Steffi Wahl (Sailloft Hamburg) both impressed throughout and produced a great comeback through the double elimination - before meeting each other in the battle for 6th and 7th - due to their seeding. 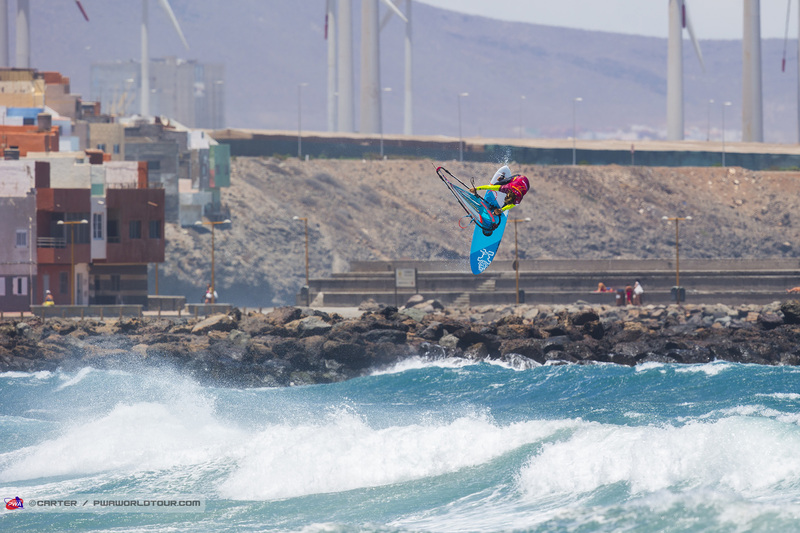 Alonso came out on top on that occasion, but you can expect to see Wahl pushing for the top 5 and beyond in Tenerife - where wave riding is often more important than jumping - and she really impressed with that. 4-time world champion - Philip Köster (Starboard / Severne / Maui Ultra Fins) - made an extremely impressive start to the season, as he goes in search of world title No.5, by remaining unbeaten in the opening event of the year and looking very confident and dangerous throughout. And while Marcilio Browne (Goya Windsurfing) may have come to within just 0.31 of a point of forcing a Super Final, it almost looks like Köster just has another gear waiting if he needs it. 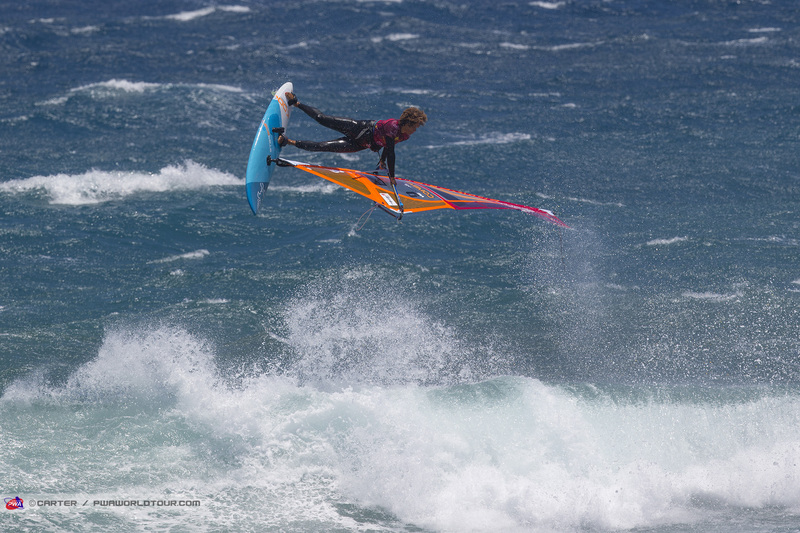 Through the contest, Köster produced incredibly jumping and wave riding and barely put a foot wrong. 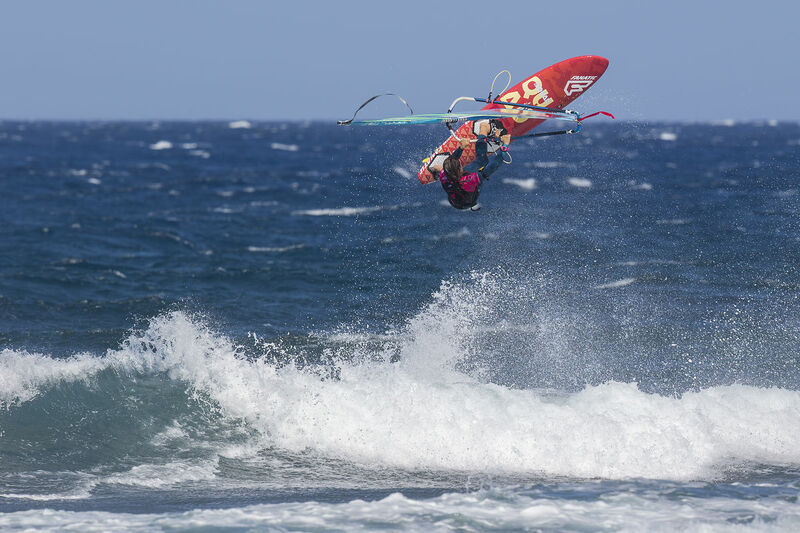 In the final, he landed a massive stalled double, pushloop forward and even pulled the trigger on the triple loop - which he wasn’t far off landing and he would be a hard man to bet against for winning the 2018 Men’s PWA Wave World Championship. Victory here also means he is now tied on 6 event victories with Victor Fernandez. 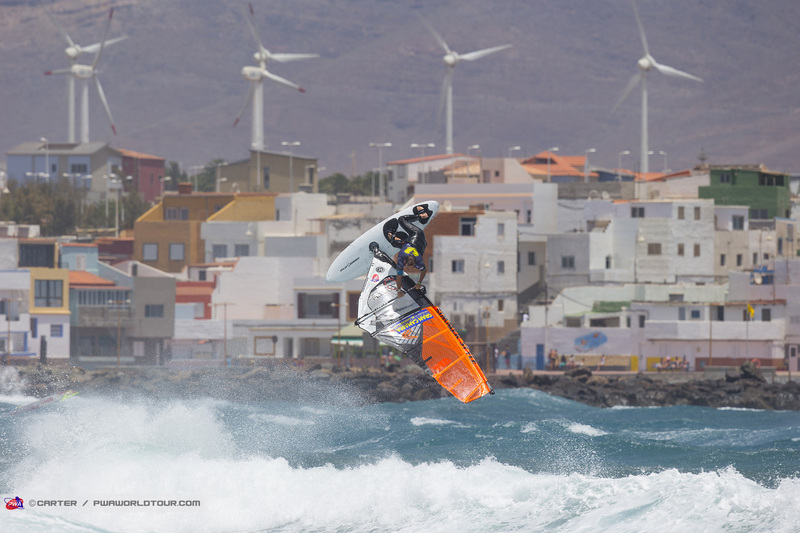 Marcilio Browne (Goya Windsurfing) makes the best start to a season on the PWA Wave World Tour after negotiating his way into the finals in Gran Canaria for the first time in his career. The Brazilian has finished 3rd overall for the last two seasons and seems to have found the formula to blend brilliance and consistency, which makes him a very difficult proposition to beat. Browne landed perfect double forwards throughout, while he was also one of just 6 or 7 sailors to land a pushloop forward, which looks like it may become as vital as the double forward if wanting to challenge for top honours. 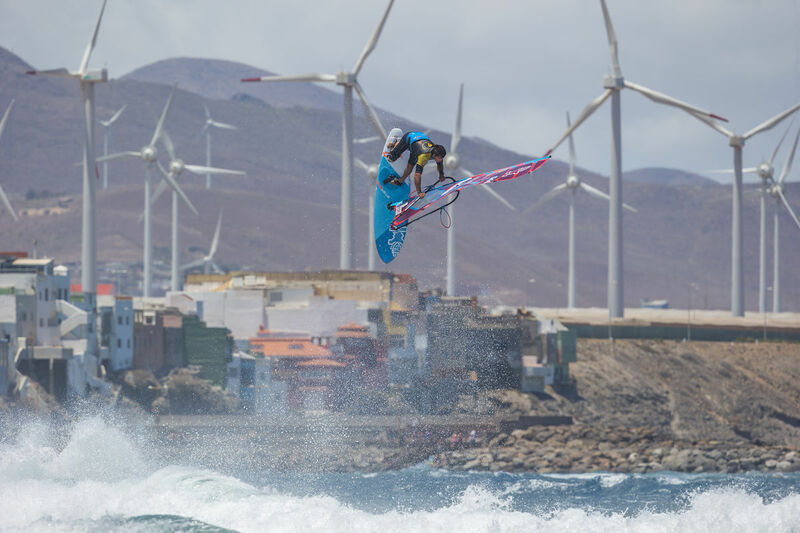 At one stage it looked like Ricardo Campello (Point-7) may come all the way back through the double elimination and challenge Philip Köster for the event title, however, he was eventually stopped by his good friend Marcilio Browne - with Browne winning the heat with his final wave. 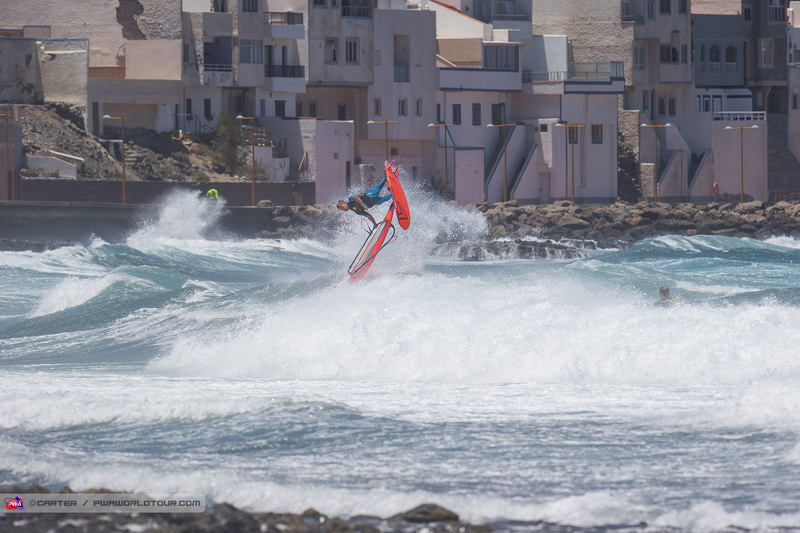 Campello defeated Dieter van der Eyken (Severne / Severne Sails), Adam Lewis (Fanatic / Duotone / SWOX), Jaeger Stone (Starboard / Severne / SWOX / Shamal Sunglasses) and Alex Mussolini (RRD / RRD Sails), before overcoming his nemesis Victor Fernandez (Fanatic / Duotone / Shamal Sunglasses) for the first time ever in Pozo Izquierdo. Campello’s epic comeback was finally brought to an end leaving him to settle for an excellent 3rd place, which is his best start to a season since 2014. Campello has the potential to be Köster’s biggest rival and he looks even more focused this year. For the first time since 2005, Victor Fernandez misses out on the podium in Pozo Izquierdo. 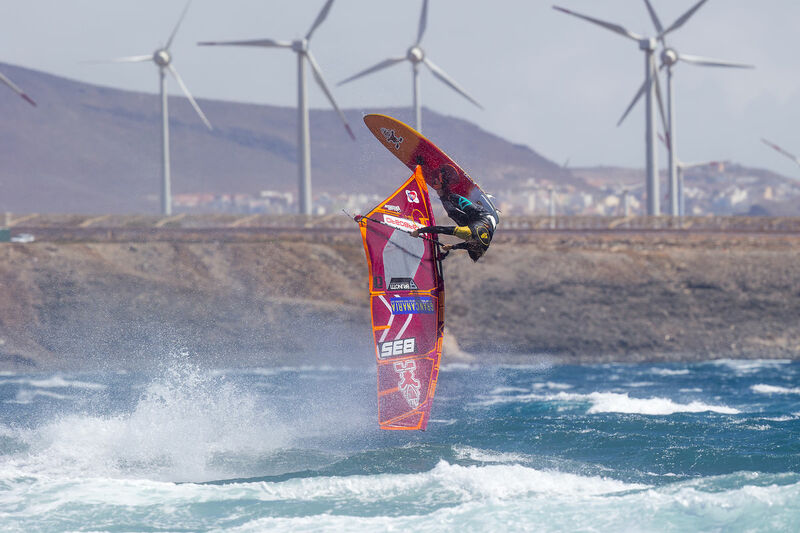 Coming into this year's Gran Canaria Wind & Waves Festival, Fernandez was looking to continue an incredible run of 6x first places and 5x second places, but it wasn’t to be, and against Campello - in the battle for 3rd and 4th - Fernandez looked flustered, which is virtually unheard of. 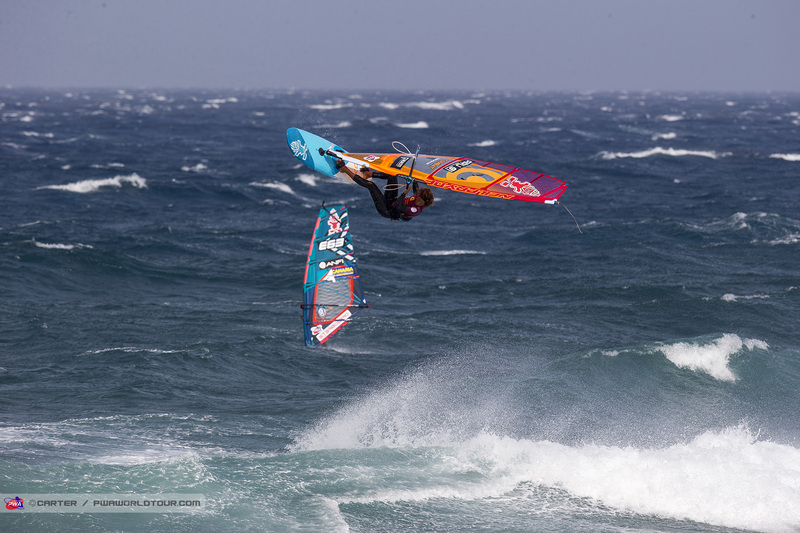 Up until that point, Fernandez was the only sailor in the top 3 (single elimination) to have reached that far without landing a pushloop forward, but he was eventually caught out with Campello claiming a decisive victory. 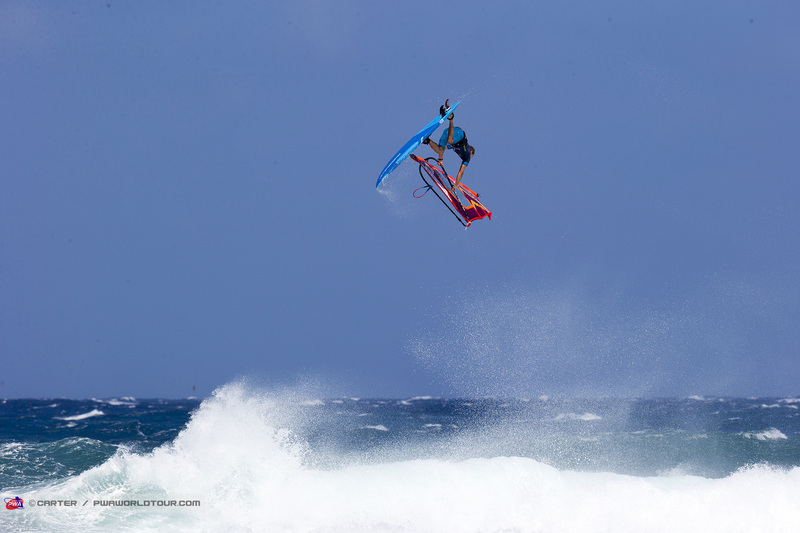 Even during the heat, Fernandez attempted a couple of pushloop forwards, and straight after the contest finished he was seen training and looked to be upping his intensity to learn this move… knowing that it may virtually become a necessity if he wants to keep contending for both event and overall titles - especially when 2 jumps or more are counting. 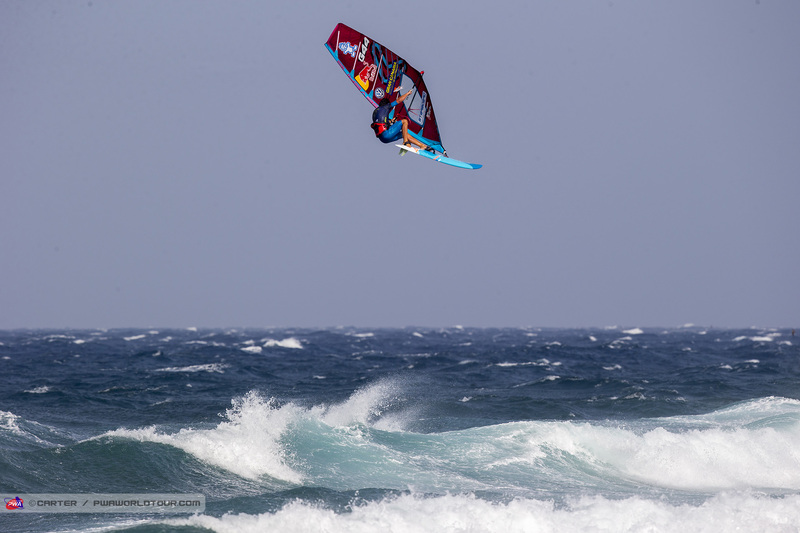 Alex Mussolini (RRD / RRD Sails) is the only other member of the top 6 here not to have landed a pushloop forward and the Spaniard walks away with 5th place in Pozo. 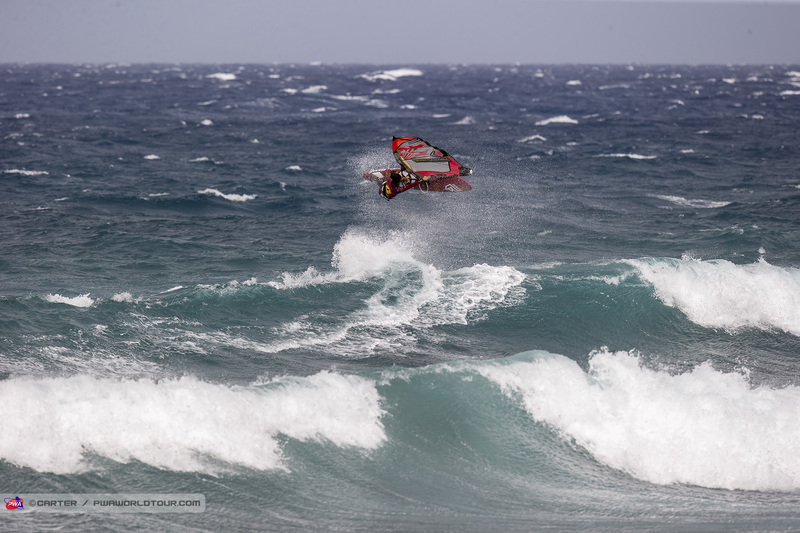 Mussolini landed trademark one-hand, one-foot backloops in the single elimination, while his wave riding was exquisite as always as he defeated Eric Sanllehy (Goya Windsurfing), Dieter van der Eyken and Jose ‘Gollito’ Estredo (Fanatic / Duotone) to move into the top 4 - before Campello relegated him to 5th. Jaeger Stone finishes the double elimination in 6th place after defeating Marc Paré (Simmer / Simmer Sails) and Jose ‘Gollito’ Estredo, while losing out to Campello by just 0.69 of a point. The Australian excelled with his powerful and dynamic wave riding earning 4 wave scores of 7.75, 8.62, 8.10 and 7.75 from 6 waves, but crucially couldn’t land a push forward in these conditions to keep his hopes alive this time around - although you could see he wanted it with his final jump attempt. If Stone can learn to land push forwards in a wider variety of conditions then there is no doubt he would be a genuine title contender as his wave riding is second to none. 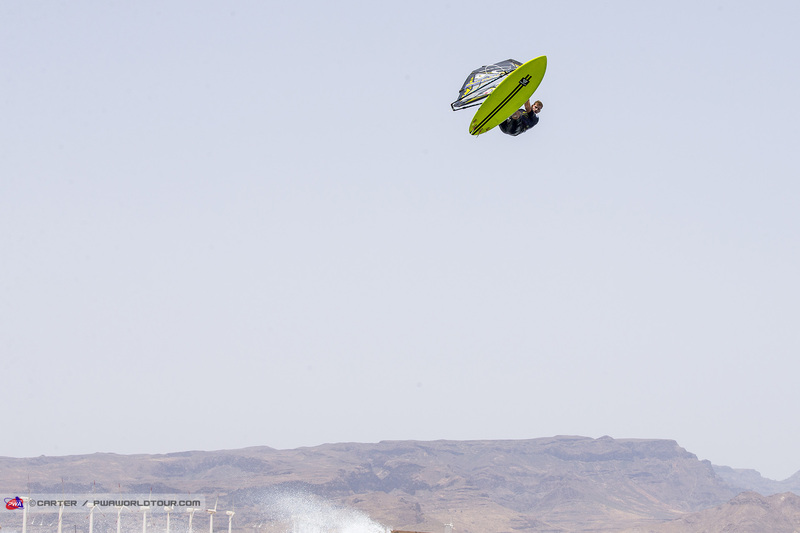 Stone also landed the highest scoring jump of the contest, as the judges broke the scale, with an insane pushloop forward, which earned 11 points. If you’d have offered Adam Lewis a guaranteed 7th place at the start of the week he’d have probably taken it - equalling his performance here from last year. But the Brit, who enjoyed his best season to date in 2016 - 5th overall - has shown that he’s not content with that and may be slightly disappointed that only a last-second wave by Campello denied him a place in the top 6 or better. Lewis regularly produces some of the highest wave scores on the tour, while he seems to have the double forward on lock, and he’ll be an even bigger threat in Tenerife - where he finished in the top 4 of the single elimination in 2017. Gollito Estredo finishes in equal 7th place alongside Lewis with the 8-time PWA Freestyle World Champion earning his first top 10 finish in the waves and showing that he is going to be a major threat, not only for the rest of the season but in years to come and there won't be too many people wanting to face him. The top 10 is completed by Marc Paré Rico (ESP - Simmer / Simmer Sails), Robby Swift (GBR - JP / NeilPryde / SWOX), Dieter Van der Eyken (BEL - Severne / Severne Sails) and Dany Bruch (GER - Bruch Boards / Flight Sails / AL360 / Shamal Sunglasses). 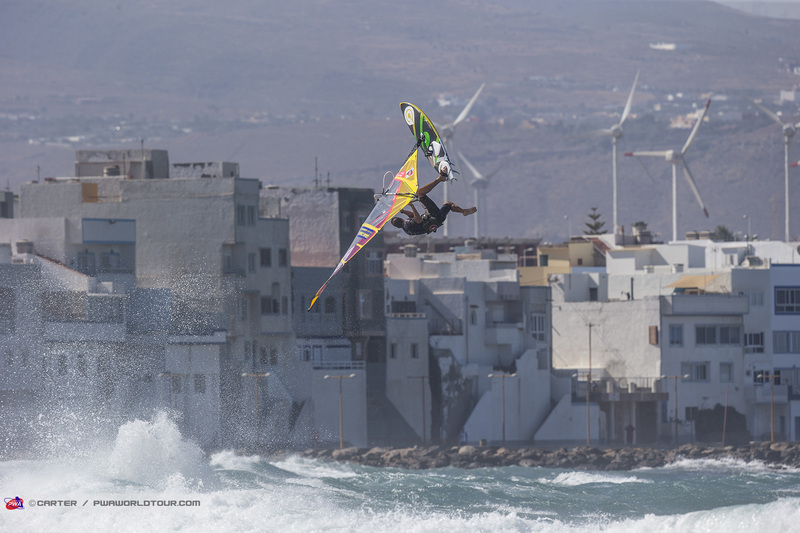 The Gran Canaria Wind & Waves Festival also hosted the second stop on the Youth PWA Wave World Tour and they showed that windsurfing is in safe hands with a set of extremely impressive performances. You can read more about how the Youth’s got on in the report here. 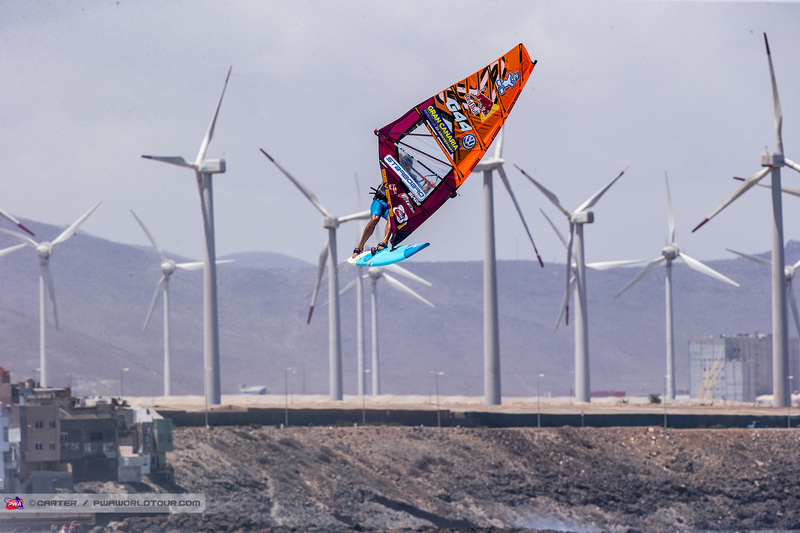 The 30th anniversary of PWA World Cups in Gran Canaria couldn’t have been any better with the Gran Canaria Wind & Waves Festival providing wind and waves every day, which resulted in 7 days of epic action. A huge thanks to the Moreno twins and their team for all their hard work and we’ll see you again in 2019. 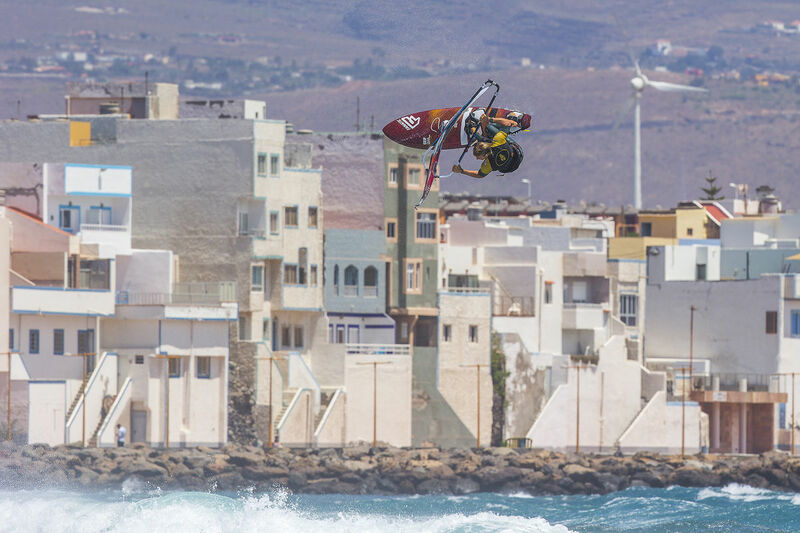 You can revisit everything that happened in Gran Canaria— including the live stream, elimination ladders, entry list, images and live ticker simply by clicking HERE and scrolling to the bottom of the page. 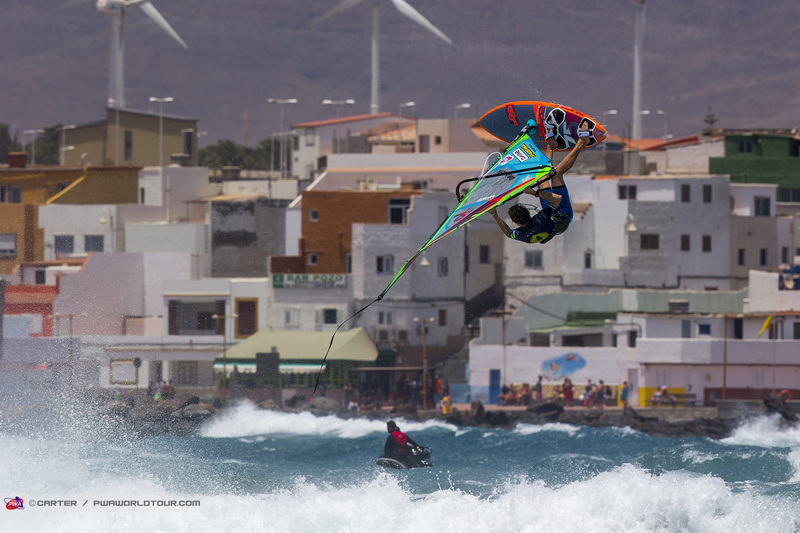 In just a few days time we’ll be coming to you live from Fuerteventura for the 2018 Fuerteventura PWA Grand Slam, which will see the Men’s Freestyle fleet in action for the first time, while the Women will be in action for the last time this season and will be fighting it out for the world title. 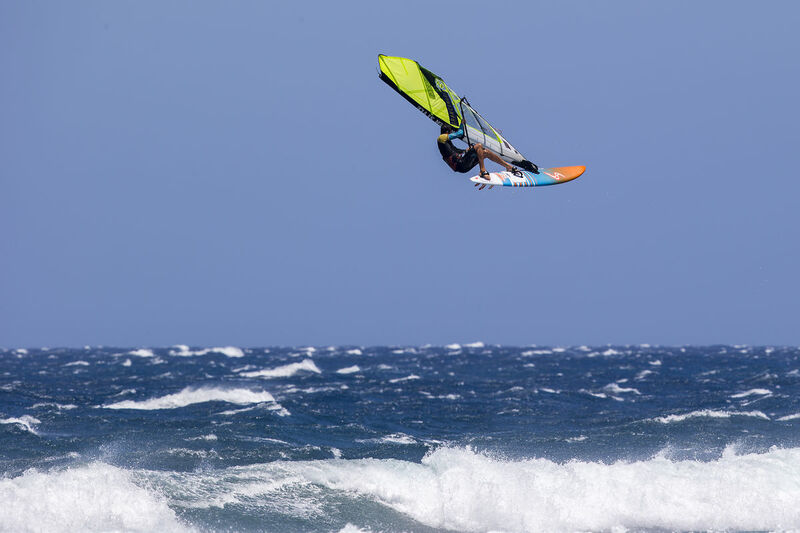 Meanwhile, the Men’s Slalom fleet will be readying themselves for their 5th battle of the season, so make sure you don’t miss of the action by tuning into www.pwaworldtour.com between 24th July - 4th August.